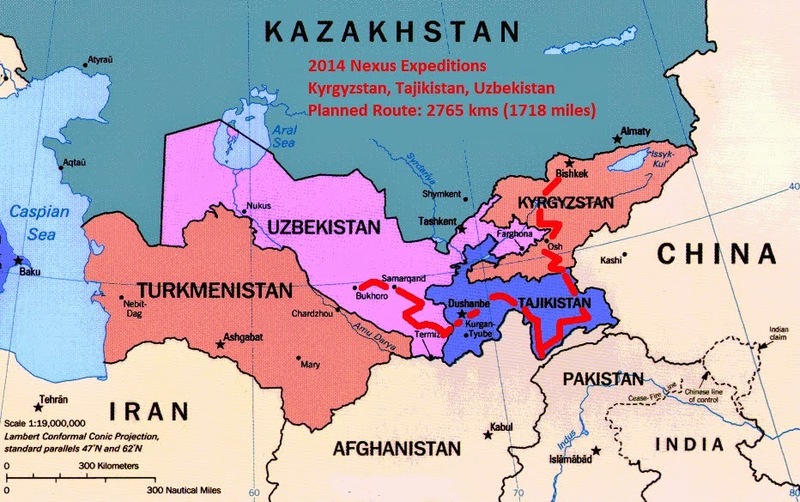 Spring and Summer of 2014 will be spent bicycling Kyrgezstan, Tajikistan, Afghanistan, and Uzbekistan. 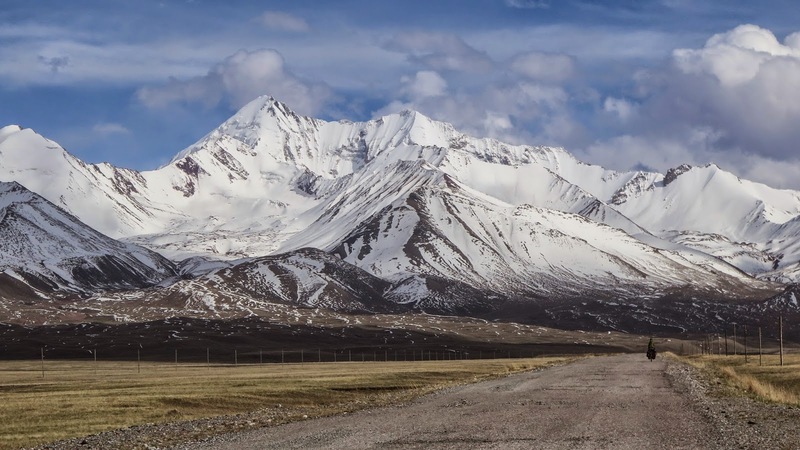 We will be cycling on the famous Pamir Highway (M41), also known as the "Roof of the World", where we will be "climbing" through mountain passes as high as 4600 meters (15,000 feet). 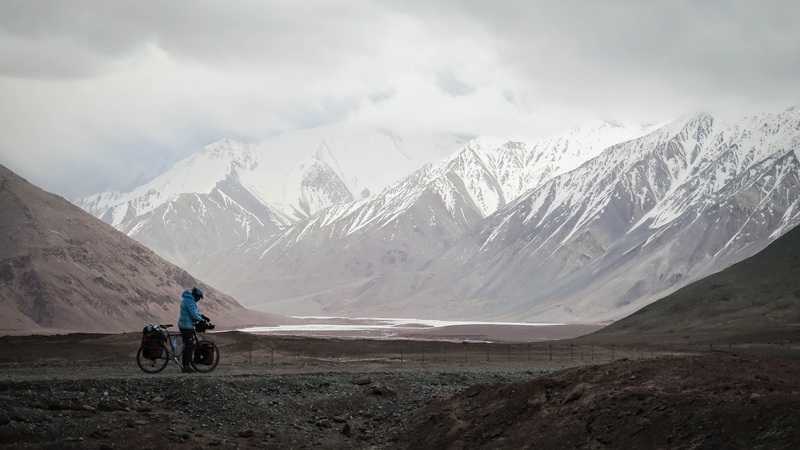 We have so far completed 1,220 kms in Tajikistan, mostly while riding through the infamous Pamir Highway, also known as "Roof of the World" and through the Ishkashim corridor. 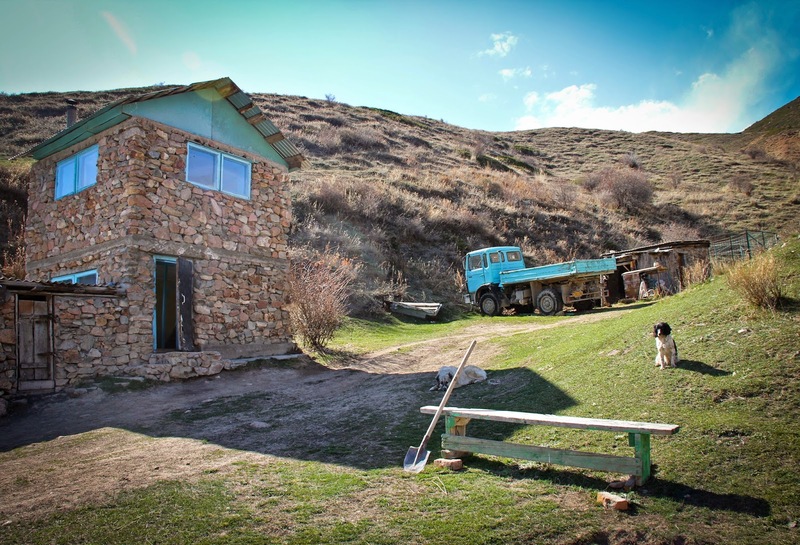 Along the way, we took some time off in Murghab, Khorog and finally Dushanbe where we visited friends. 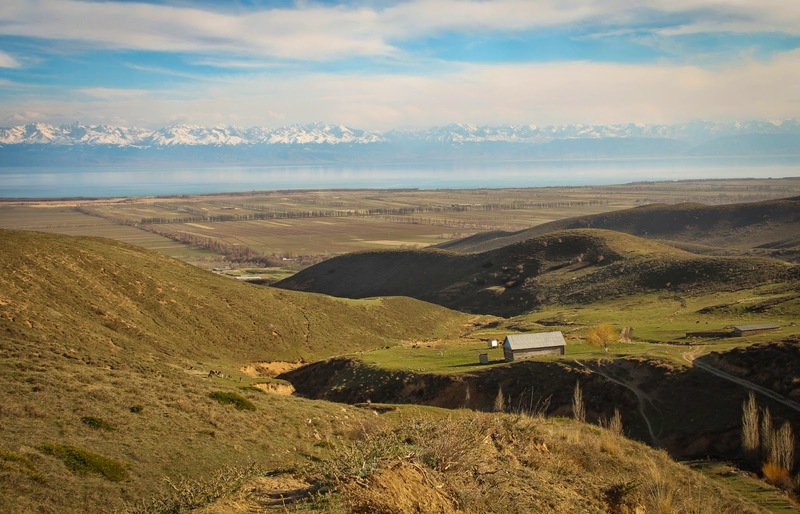 In early July, we also had to leave Tajikistan for a few weeks to attend a family reunion in Kazan, Russia, in Gulnara's family, renew a Tajik visa and repair a bicycle rear wheel! 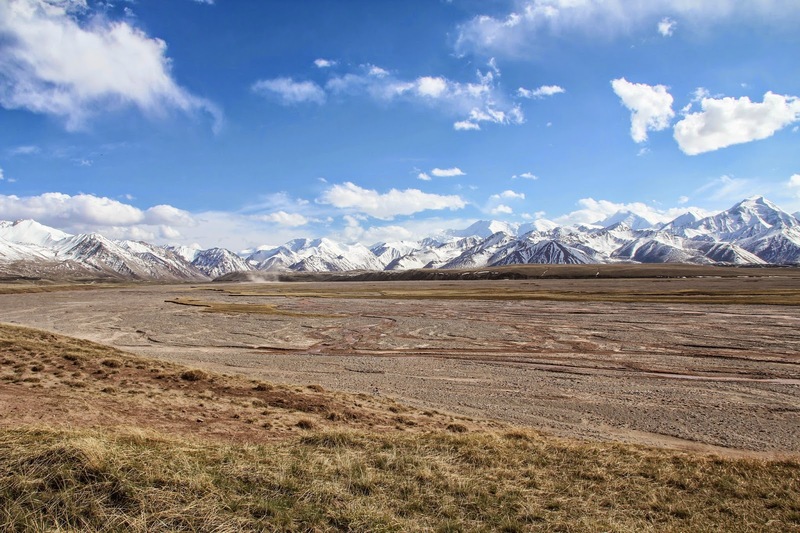 Riding through the Pamir 4000 meters+ mountain passes as well as encountering a very rich and welcoming local culture was a terrific experience. 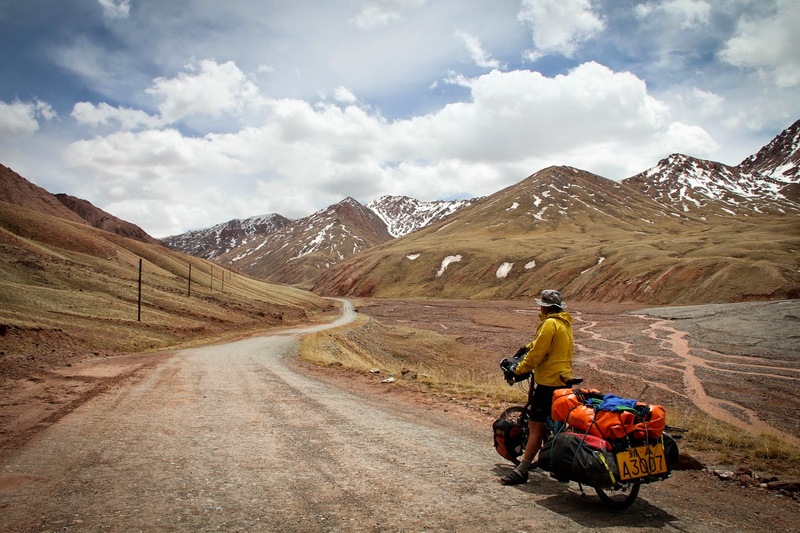 We definitely plan to share this great experience in details (through stories, photos, videos) on our website and blog in late September but for the time being, we need to start cycling west towards Uzbekistan before my new Uzbek visa expires! In the meantime, we are proud to tell you that we have just completed an 80 minutes full-length documentary which relates the first few years of Nexus Expedition. If you wish, "like" the Facebook page "The Traveler", to receive updates as the distribution adventure begins! This movie was co-produced by Erik Nachtrieb and Vivienne Smith. Thank you Erik and Vivienne for your great support while having sieved through terabytes of raw film! 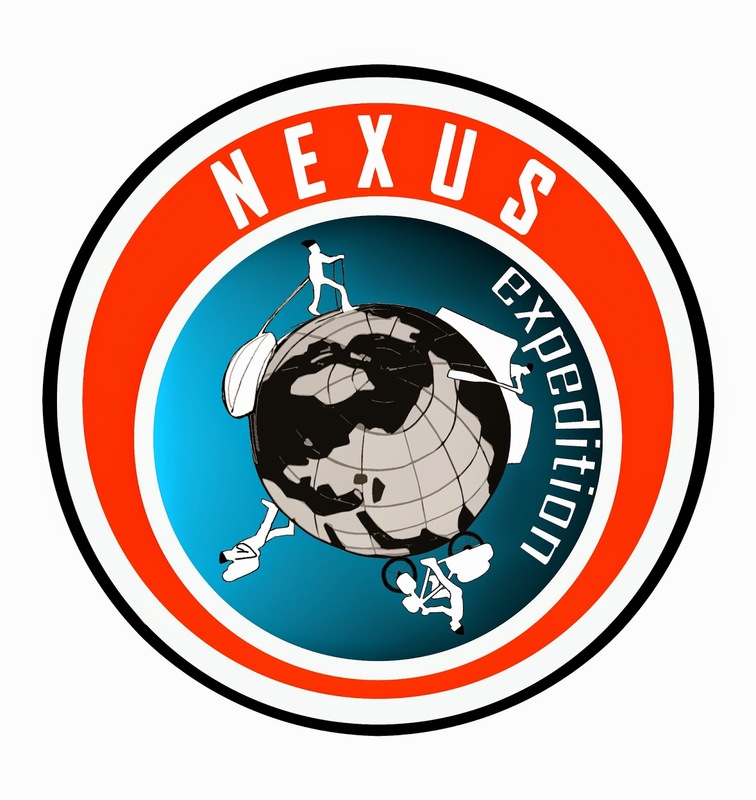 Finally, we would like to announce that we have a new logo for Nexus Expedition! We have decided that it was time to get a new logo to better reflect the different human-powered modes of transportation used by Nexus Expedition in the past, present and future while circumnavigating the planet! Thank you, artist David Verchot for this great new logo! 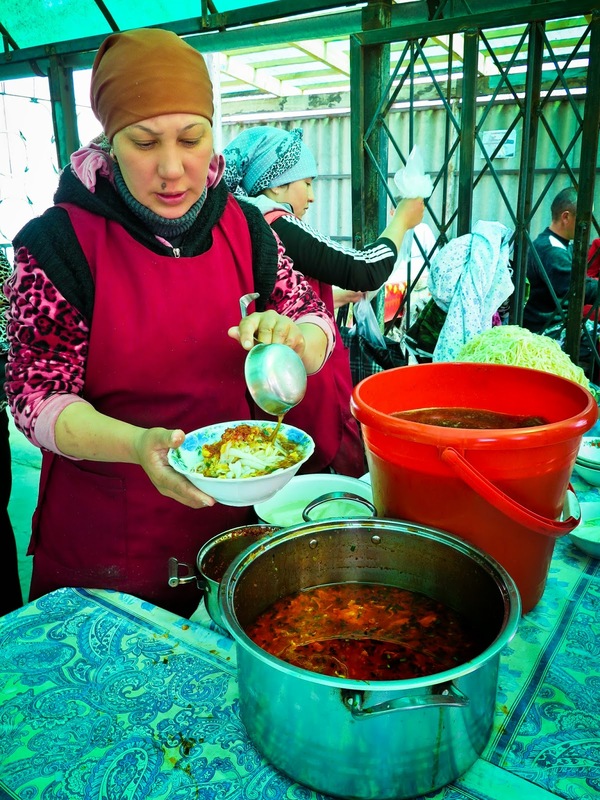 Hectic first steps into Tajikistan! 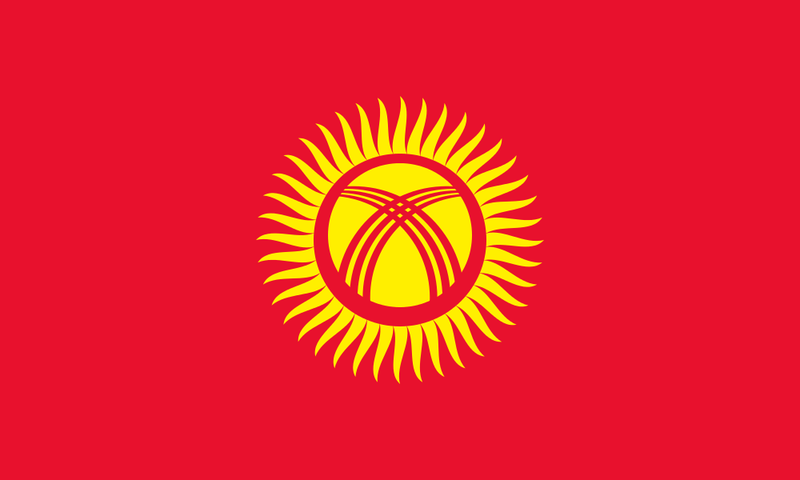 A few weeks ago, prior to starting cycling through Kyrgyzstan (an experience in itself, which we will relate in later posts), while in the northern capital of Bishkek, we planned ahead and were able to obtain a 45 days Tajik visa, a quintessential GBAO permit, and even a one month Afghan visa in order to be able to venture in the safer Afghan Wakhan corridor, which is historically nudged between Tajikistan and Pakistan. 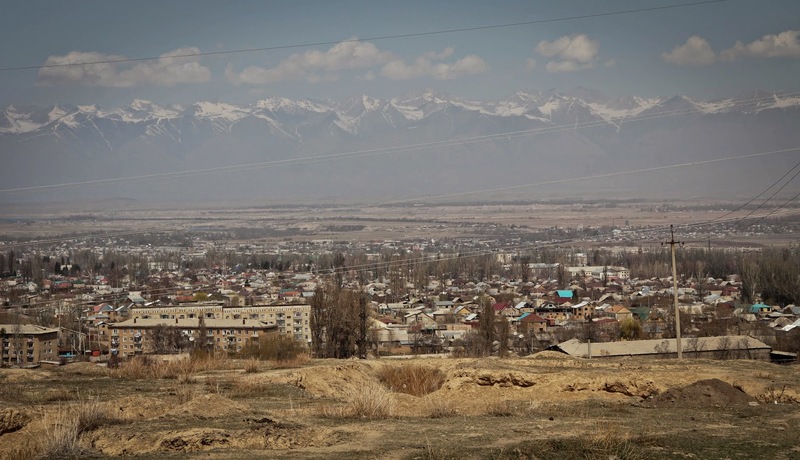 On May 23rd, as we got closer to the Tajik border, we were informed by some of our "warmshowers" friends in Dushanbe that in Pamir’s largest city, Khorog, there had been violent clashes/riots between locals and the police forces, resulting in three deaths. Consequently, the region was currently closed to foreigners. In addition, knowing how slooooww we were progressing South through the Kyrgyz 3000+ meters incessant roller coaster, Gulnara and I felt we could continue forward with our plan, assuming that by the time, we would enter Tajikistan on our bicycles, the recent turmoil would have hopefully been resolved. 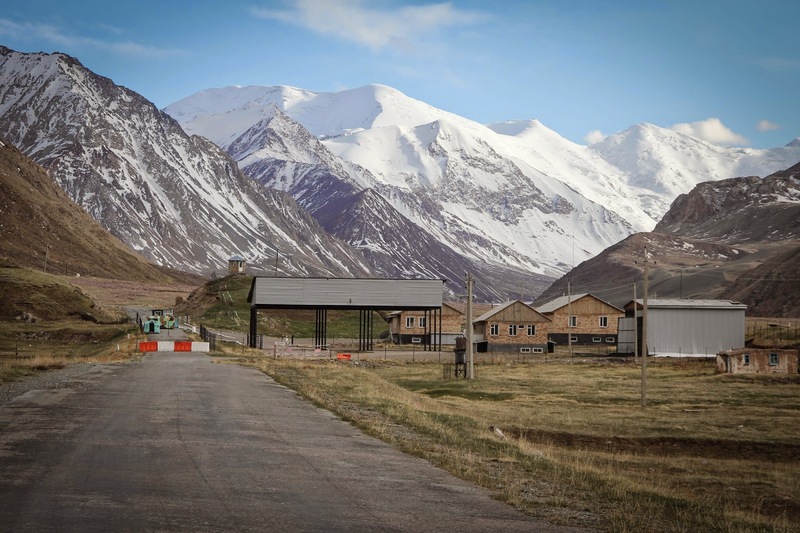 So, after having departed from the “Urban type settlement” (посёлок городско́го ти́па ) of Sary-Tash, a village at 3200 meters, conveniently situated on a wide open plain at the convergence of three roads leading to Osh (Kyrgyzstan), Murgab (Tajikistan) and Kashgar (China) where the economy mostly lives off the income of stationed border guards, cross-border legal and supposedly illegal trafficking as the rumors go, and finally animal husbandry involving a few yak, cattle and sheep herders. 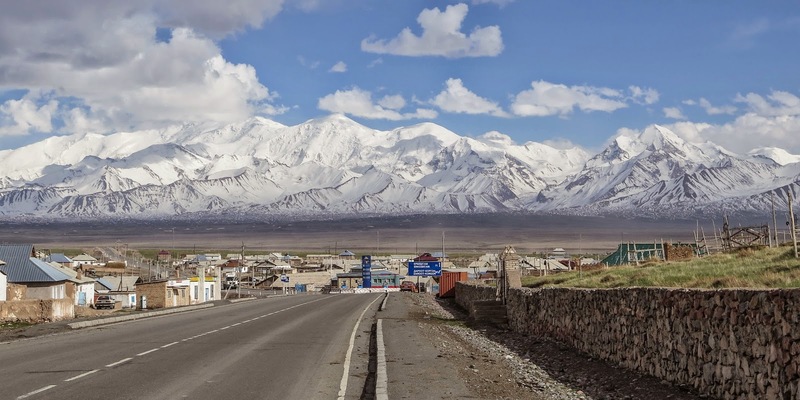 In summer time, the town also caters to the intrepid climbers storming through town on their way out or back from the culminating 7,134 meters Peak Lenin. As we left town, we first noticed, impressive soviet-style border guards barracks, located on the flanks of the adjacent southern mountains where we could perceive in the distance, border guards busy playing basketball, while their colleagues were diligently guarding all borders to possibly prevent any Chinese or Tajik invasions… We proceeded further southeast and ran into a German-Australian couple, two motorcyclist writers, Christopher and Laura, who were coming out of the Pamir highway, in our opposite direction, on their iron beasts (a Yamaha Ténéré and a 1996 BMW F650), fully loaded with everything and I mean everything; including an Uzbek cactus, folding camping chairs, a stuffed bear riding a stuffed dolphin, and a built-in iron clamping vise conveniently placed on the rear bumper to repair parts! 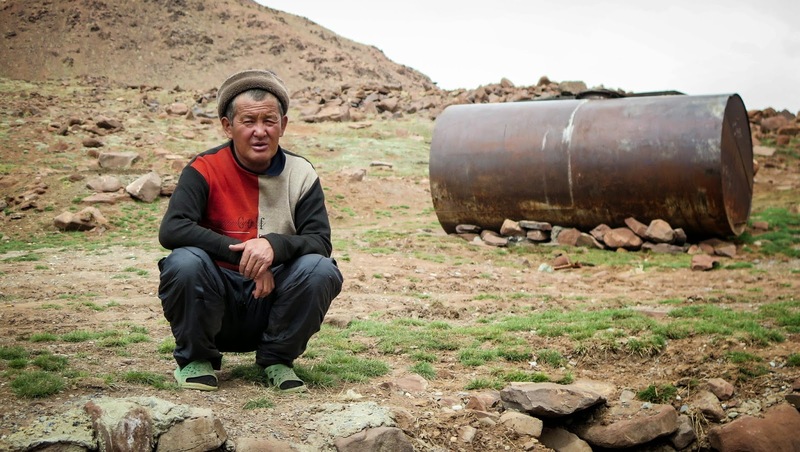 Christopher was sporting a beautiful WWI Finnish army leather overcoat which gave him a Mad Max look, lost in the middle of Central Asian landscape. We exchanged a few words, sharing with each other’s, information on road conditions and abodes we could encounter along our ways. We also pondered about each other’s choices in vagabond life and agreed that we should reconvene someday, somewhere on this planet to share a glass of wine. 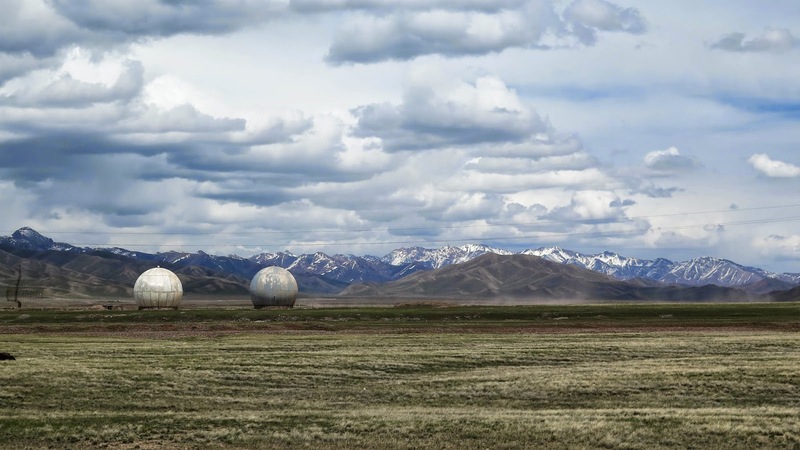 A few hundred meters further, while cycling towards the snow covered intimidating 7000 meters+ Pamir mountain range which was widely spreading all across our southern horizon, we started noticing in the middle of the wide open plain, two giant "golf balls". Intrigued by this perfect symbol of Soviet minimalist although futuristic architecture, I felt immediately magnetically pulled towards them. 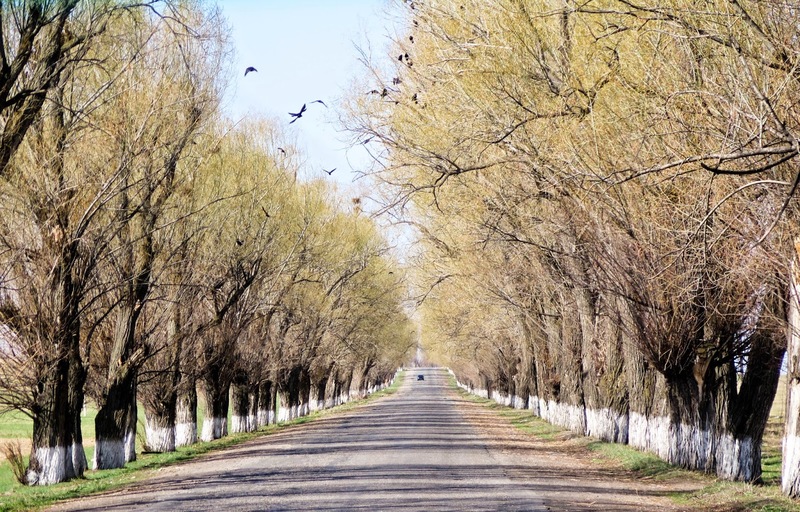 Gulnara, as she had experienced in previous similar ordeals where my curiosity lead me to some kind of trouble, chose instead to wait for me on the main road and observe from far what was about to happen to me. 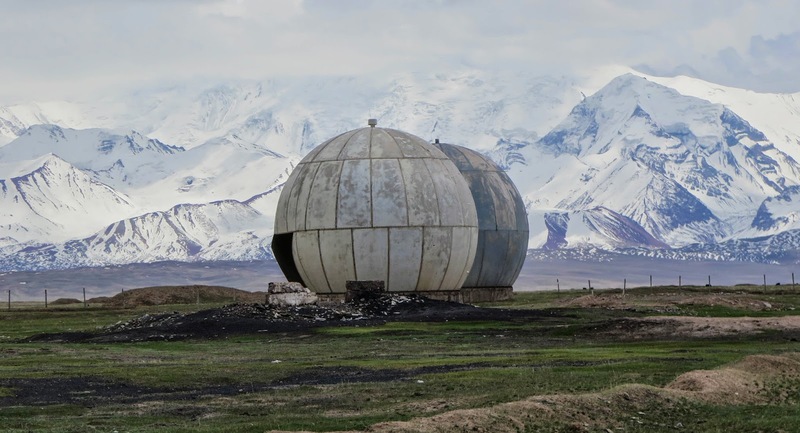 I arrived at an old soviet gate, adorned with a beautiful red star, and decided to proceed further in, to get even closer to the giant balls and to other derelict radar equipment left nearby. At first, their sublime simplistic design reminded me some of the giant iconoclast structures I have observed over the years, planted in the middle of the Black Rock Desert in Nevada, during the yearly Burning Man festival), Then, I found them attractive because they were reminding me similar defunct radar antennas I have seen over the last few years while walking through Far Eastern Russia (Chukotka) and especially in Alaska, USA, where they were built during the height of the Cold War, to enable Russian and Americans to better listen to each other, way before NSA’s Edward Snowden was ever born. 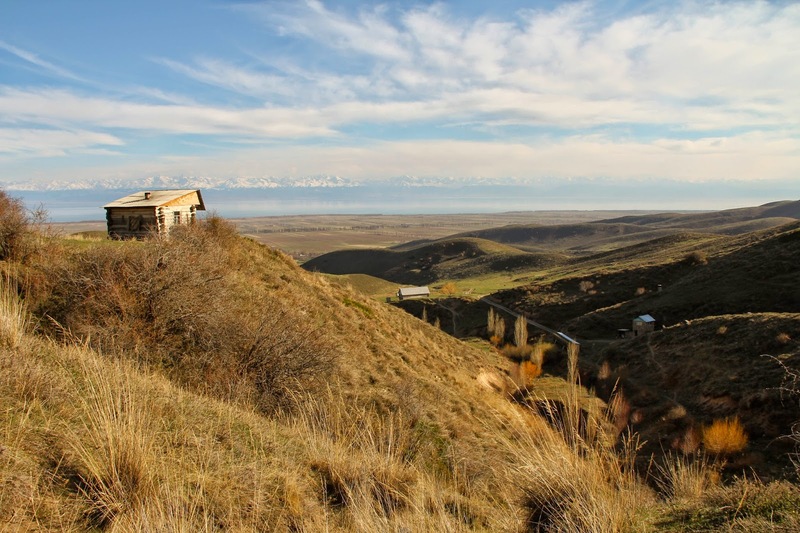 They were the “ears” of the Distant Early Warning (DEW) Line and its Soviet counterpart. 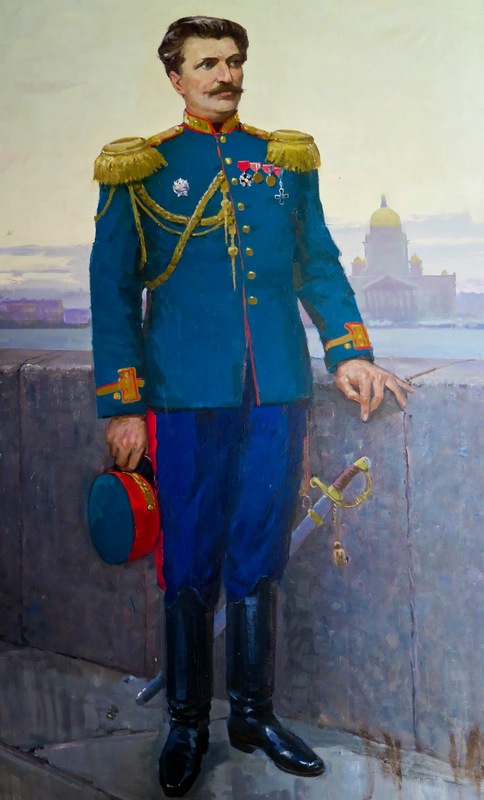 After all, it made perfect sense for some of them to be here as well, rusting / deteriorating, since we were right at the junction between the ex-Soviet Union Empire and Mao’s "ex-Middle Kingdom". Two communist neighbors who were also relishing in the 1980s at the idea of being able to secretly (or not) listen to each other. 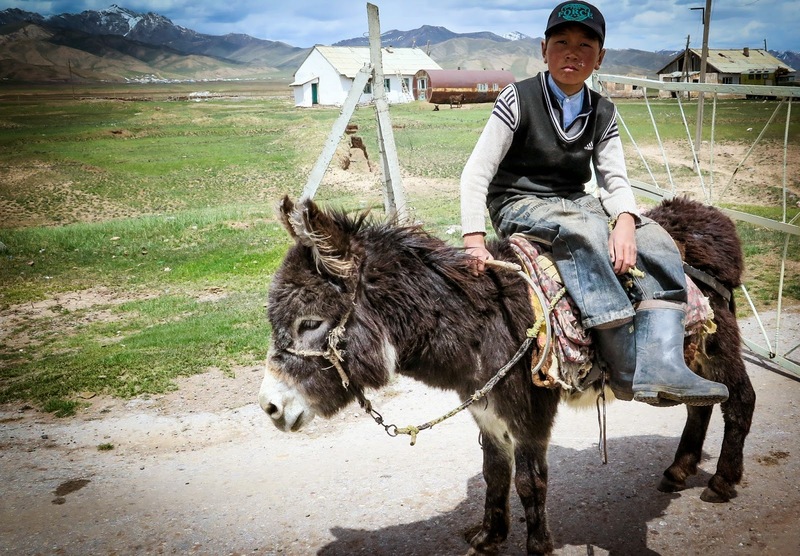 As I was about to pass through the rusty abandoned gate, I saw behind me a 10 years old young Kyrgyz boy galloping on his donkey from a distant yurt and rapidly approaching me, or at least as rapidly as a donkey can fathom. 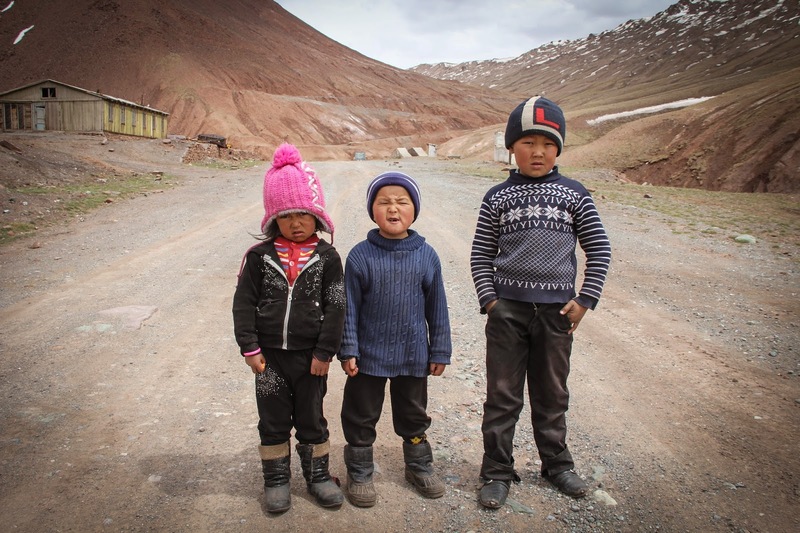 The young boy arrived and spoke to me exclusively in Kyrgyz. I tried to explain to him in Russian that all I wanted to, was to approach the giant golf balls, take a few shots and immediately leave. He responded with a resounding “Niet! ” and gestured to me that if I was about to make one more step further through the gate, men with machine guns will come and shoot at me. No idea where they could have come from and how quickly they could have been deployed, nevertheless, I decided to leave the vicinity illico-presto on my bicycle. Call me crazy but for me and at that moment, no close-up photographic shots of defunct radars could justify the risk of a few actual bullet shots. 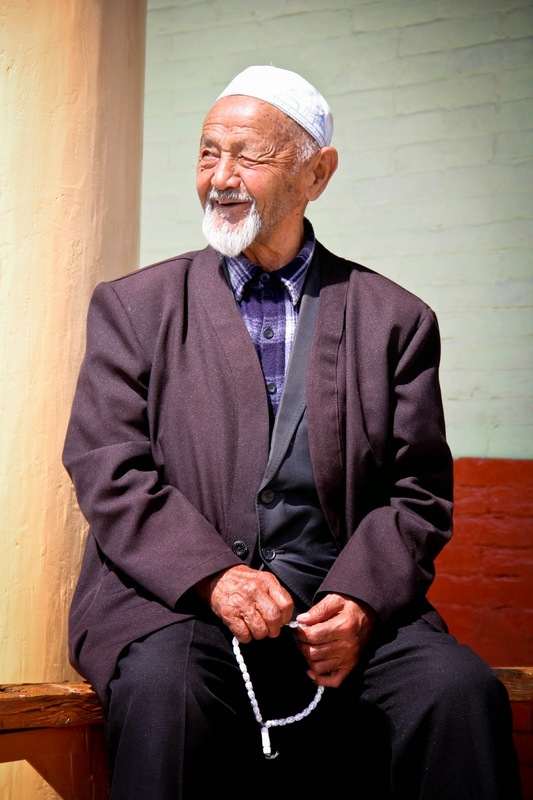 I rejoined Gulnara who was, by that point, smirking away, amused at the entire comical situation. Her late 40’s supposedly grown up man, chased away by a 10 years old boy on a mighty donkey. 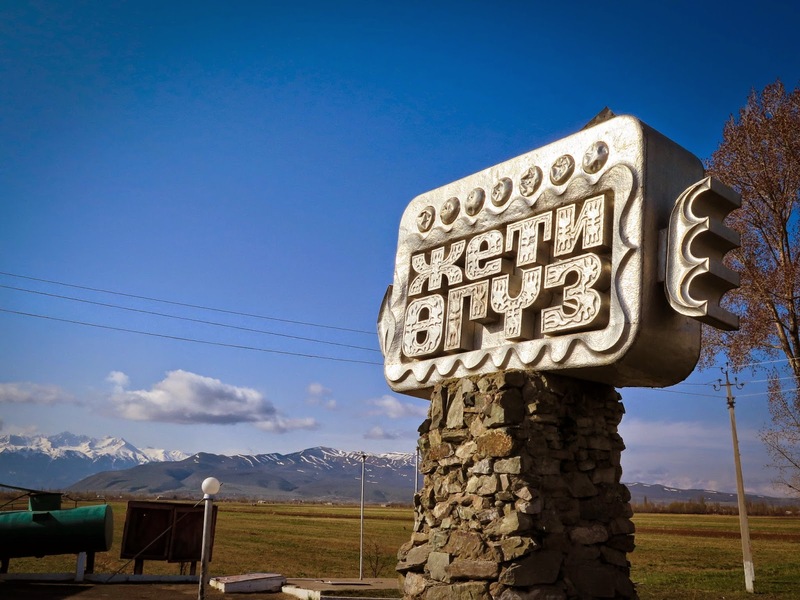 We proceeded further south on our deserted asphalted road, not encountering any traffic for hours, since this Kyrgyz road had been blocked/barricaded with concrete blocks and yurts for the last few days, 70 kms further “upstream”, by protesters in support of detained opposition MPs. Not an uncommon practice in the democratic republic of Kirgizia, when one group wants to voice loudly his opinion. 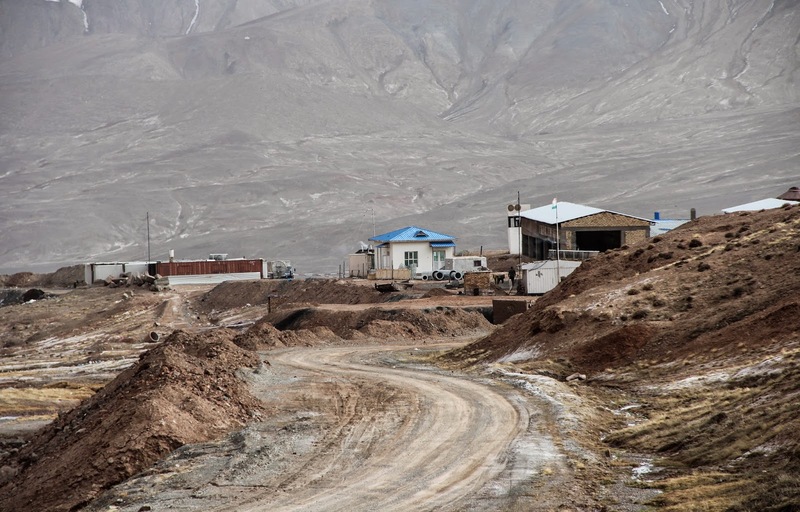 Usually, it tends to be more effective if the road blocked is one where usually large Chinese trucks pass through, importing machinery for Chinese owned refineries, cement factories, and mines on Kyrgyz territory. I can only imagine how bewildered and possibly furious Chinese managers must be, when the Kyrgyz government chooses to not intervene for days or weeks. 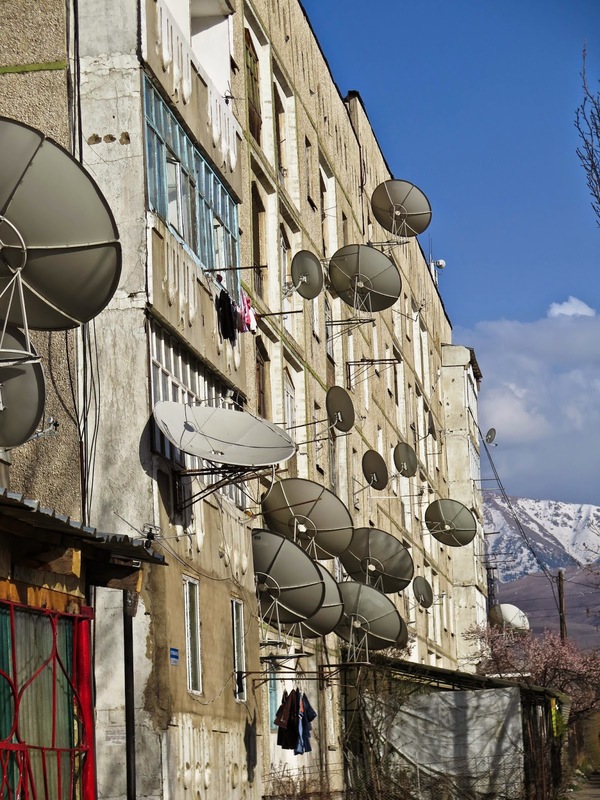 It would probably not goes the same way in neighboring mainland China. As a direct result of this protest, I was unable to find transportation for our spare bag of white gas, extra bicycle tubes and tires, Nuun electrolytes as well as additional peripheral spare items. I was indeed hoping to send this bag aboard an inviting vehicle, possibly hundreds of kilometers ahead into Tajik territory to a location we were planning to reach at a later date. Eventually, we will run out of this precious white gas and this extra bag will either get lost or potentially be stolen somewhere along its way. 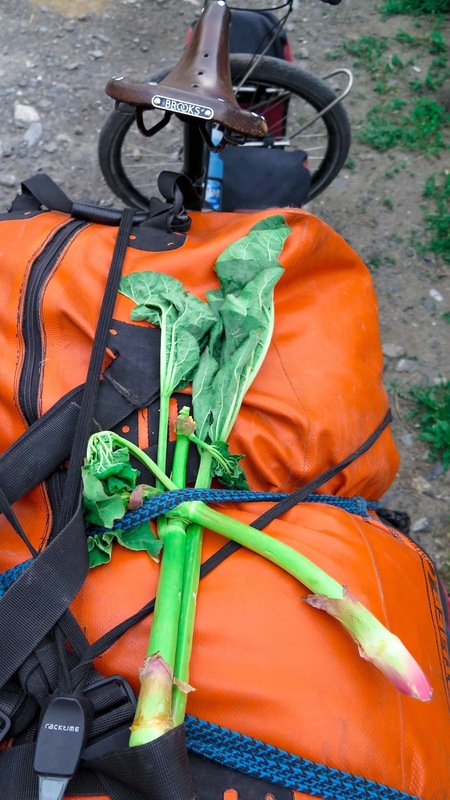 But for the time being, I was not willing to forego this “buoy” and decided to drag it alone, strapping in on top of my already way overloaded long framed Surly Big Dummy cycle. Don’t ask me why, I am not quite sure what to answer! Let’s just say that during the earlier years of this expedition, I was free to play “snake”, loading all what I wanted while pulling a sled through the arctic tundra. I quite enjoyed having all of the extra comfortable gear with me, such as extra warm clothes, a roomy 4 seasons tent, white gas, a large selection of food supplies, electronics, computer, etc… etc… Making in a way, my sled and tent, a second home! Old habits die hard and I have not been able yet to make the complete switch to “light riding”. I am actually not quite sure if my brain will ever be able to cope with this necessary adjustment. 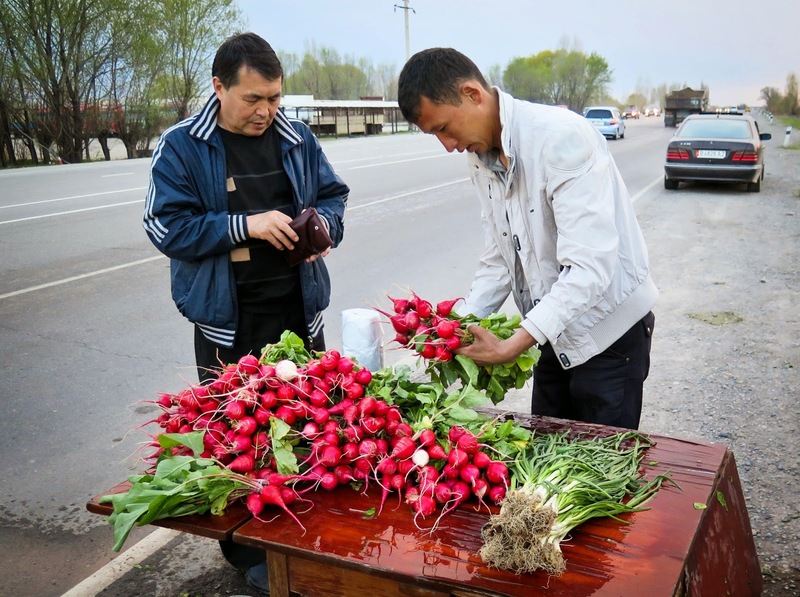 On our way, we stopped for a small picnic made up of a can of peas, a few slices of bread, Kyrgyz “Swiss cheese” and above all, a few wild rhubarb stems, which we were able to buy from younger boys on the side of the road a few days earlier. 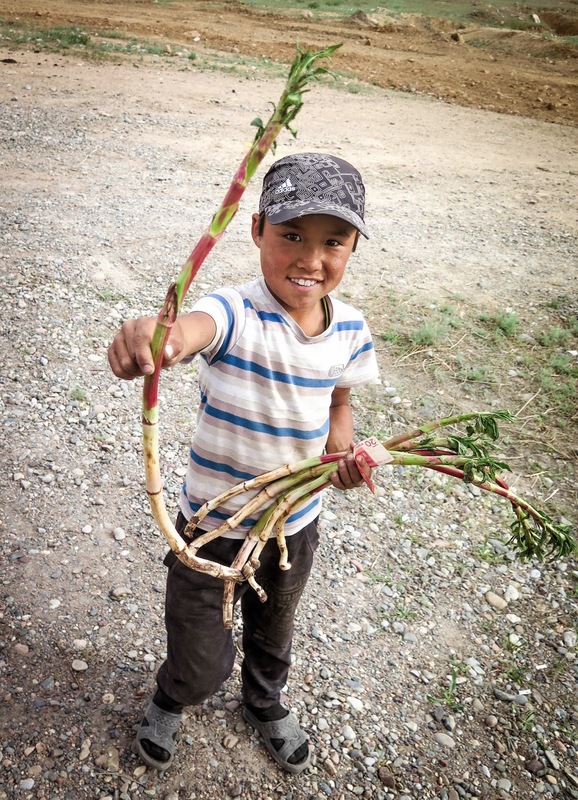 The Kyrgyz call these wild rhubarb stems: “kislichka” (“Bitter ones”). They need to be peeled before eaten raw to somewhat reduce their outer bitterness and still somewhat require adventurous taste buds. 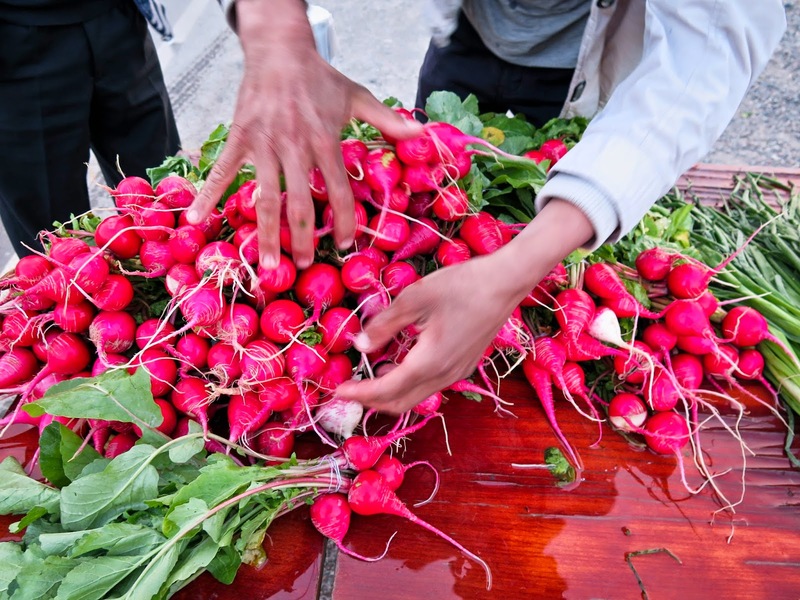 I mostly enjoy eating them because of the novelty they represent to me, and because we only have a limited choice of fresh vegetables in this south eastern corner of Kyrgyzstan. While eating, we had at one point to stop and rapidly cover our food with our tent floor mat, which we use to comfortably lay on, whenever we are stopping to picnic along our way. The fast “duck and cover” operation happened because a sand whirlwind stormed through our “dining room” while we were peacefully seating. 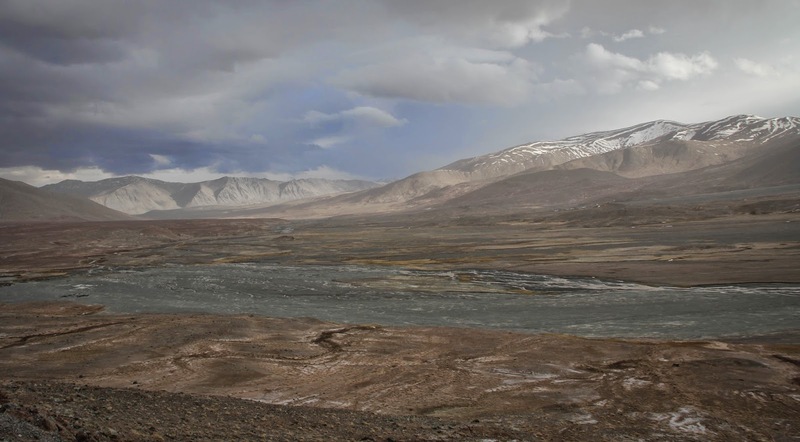 Indeed, later on, while riding further south through this plain, we could observe a large amount of magnificent whirlwinds and were also puzzled how low the clouds seem to be, or more appropriately how high we were, progressing towards 3400 meters. 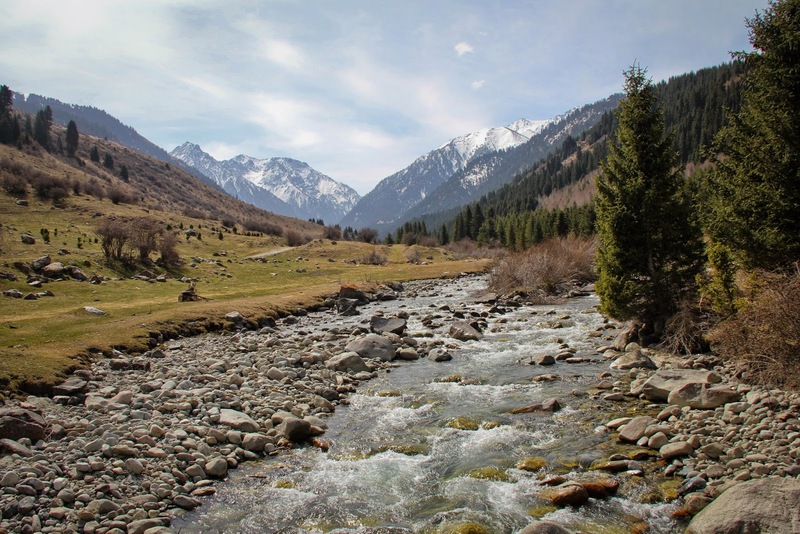 A few kilometers further, longing a river, we entered a small canyon where around a bend, we came to the Kyrgyz border post, open all year along at an altitude of 3475 meters. An impressive infrastructure, ready to inspect tall trucks in a place where actually no large trucks come through but simply an average of 3-4 cars a day: a few ubiquitous soviet UAZ-452 mini-buses (‘Uazzik’) transporting Tajik and Kyrgyz families between Sary-Tash and Murghab, as well as a few European travelling in 4*4 cars/trucks, a few international motorcycles and about 100 to 200 intrepid cyclists a year. We first had to pass through a chained gate which we could simply open ourselves and proceeded to the first barrack. There, the young Kyrgyz customs officer invited us inside to stamp our passports. 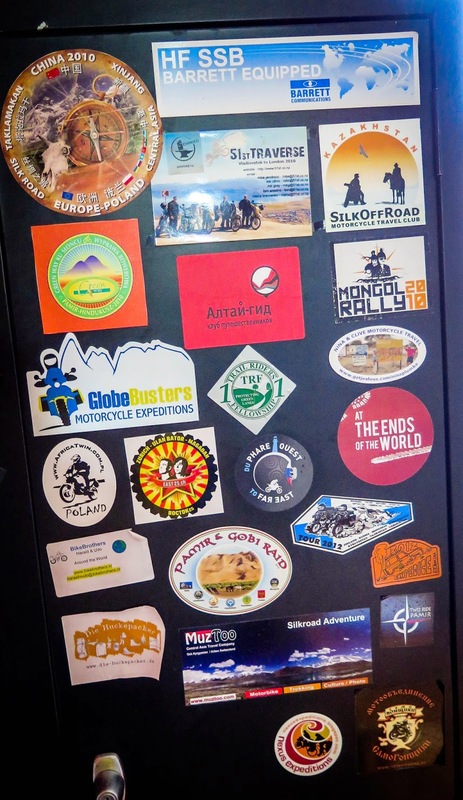 In his office, on the side of a tall metal locker, I noticed a large amount of western european, eastern european and russian travelling motorcyclist vinyl decals, and asked him if we could also emblazon his piece of furniture with our own Nexus Expedition cycling one! Having done that, I was also given the permission to take a picture of the armoire. Of course, I pushed it a step too far, taking a shot of the detailed AK 47 schema which was also on this wall. The customs officer immediately became mad and asked me to promptly leave which I obviously obliged to. 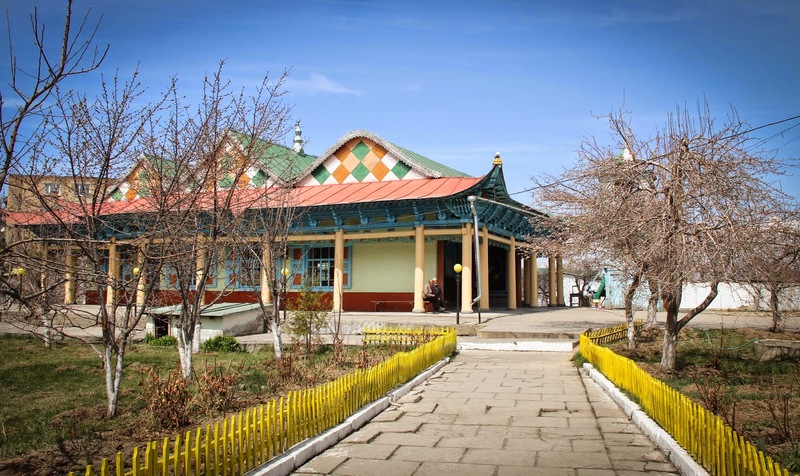 The next step to complete in the following barrack was in company of a young coughing Kyrgyz immigration border guard. He was clearly frustrated to see how “poorly” my French passport had been stamped by the Kyrgyz border officer in northern Bishkek. 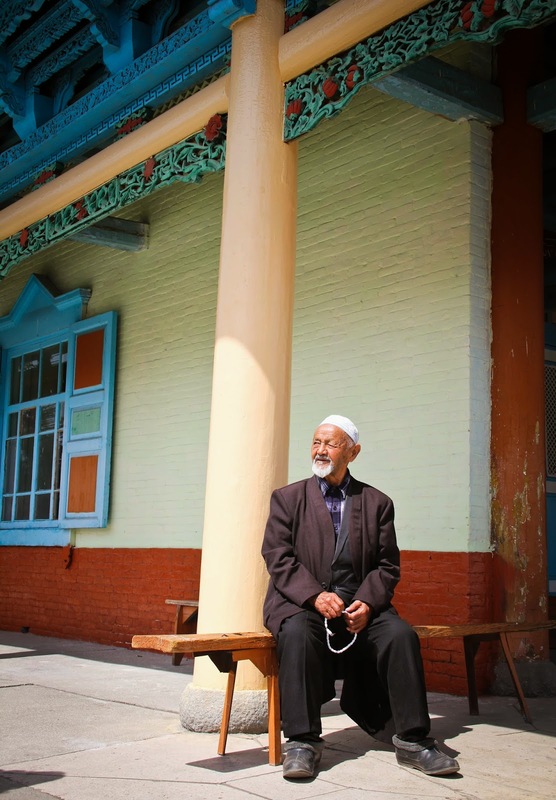 He mentioned that he nevertheless was able to spot on our Kyrgyz entrance stamps, the matriculation number of the Bishkek officer and was planning to report her for poor workmanship (in her crucial stamping skills) . He finally proceeded to mark our both passports with this time, beautiful clear exit stamps! 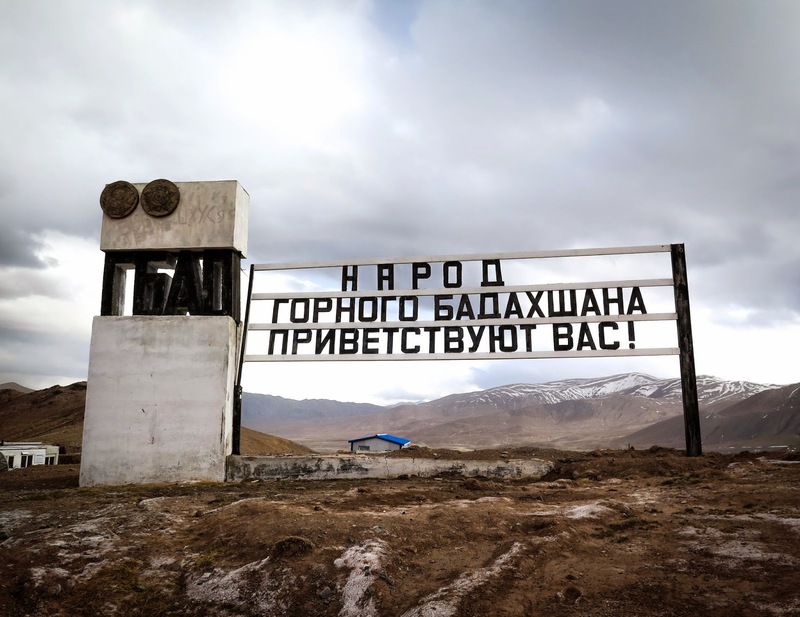 Considering that it was 18h00 and aware that before we could reach the Tajik border checkpoint , we had to cover 23 kms away across this “No man’s land” and over our first 4300 meters pass via a muddy/dirt trail, precautious Gulnara decided to ask the officer if we could be allowed to plant our tent in between the two borders in this unoccupied mountain pass. The officer ,at first, kindly offer us an old barrack ,near his own, where he was inviting us to plant our tent inside, and finally agreed to authorize us to proceed further through in order to sleep in this “disputed” territory. He then asked to ride one of our bicycles. Gulnara offered hers which he gladly accepted for a quick spin around the barracks. We decided to leave the barracks, moved five kilometers further up the canyon and as the sun was about to set, around 20h00, we found a nice and flat spot near the trail to camp. We planted our tent, made a diner of ramen noodles and quickly fell asleep. 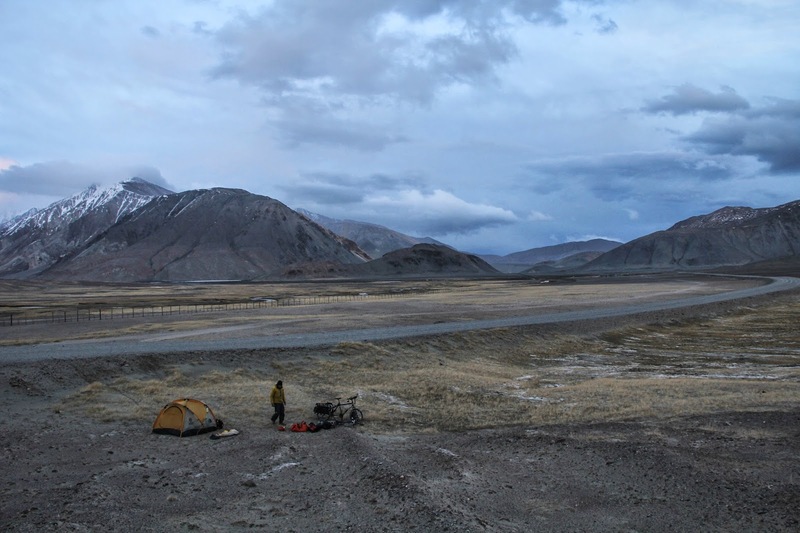 Around midnight, we were woken up by a screaming voice: “Come out (of your tent)! It’s a border zone, you are not supposed to be here. 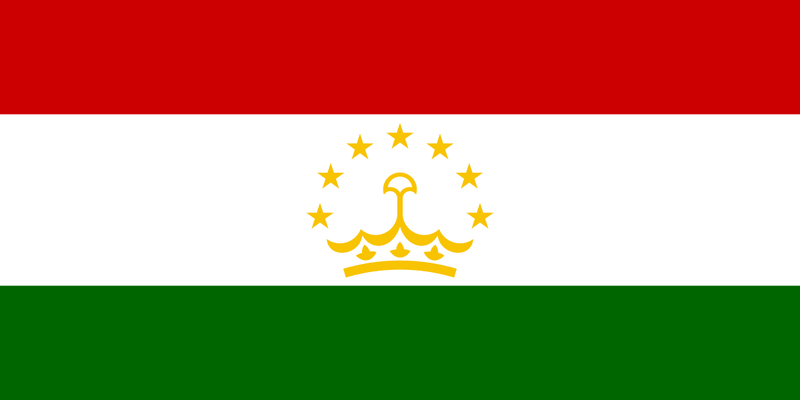 We saw you leave the border post and we assumed that by now you would have reached the Tajik border post. You need to move now!” I came out of the tent, explained to the screaming voice that the first officer at the barracks had allowed us to camp in this “No man’s land“ and that we were planning to leave early in the morning. 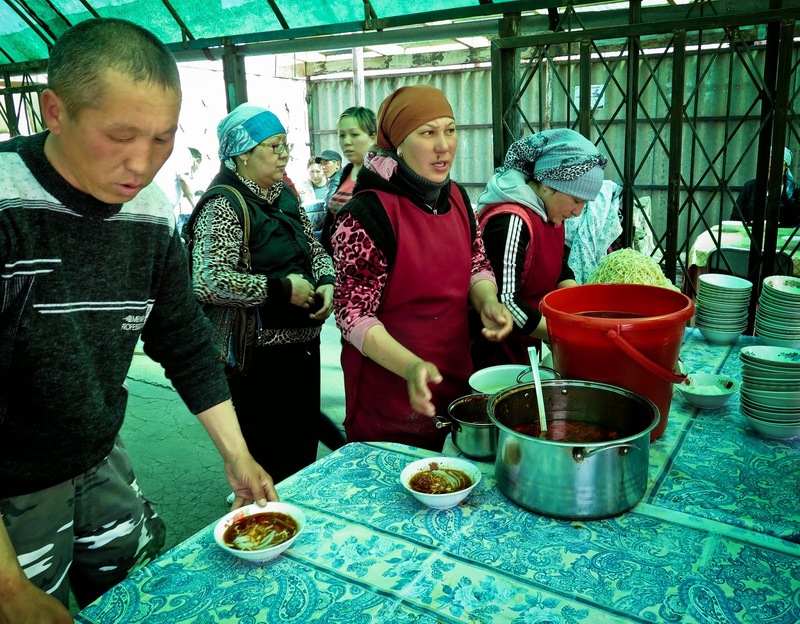 The Kyrgyz border guard agreed. I noticed at that point, that while this first man was pointing straight into my face one of the brightest torches/lamps I have ever seen, I could discern behind him, the shadow of a 2d guard holding in his hands an AK-47 type of machine gun. Very glad to observe that neither one of them were trigger happy, and that we had come easily to an agreement, I went back to our tent and tried to fall asleep as quickly as I could in company of Gulnara , while visualizing all of these Kyrgyz border guards marching through the night, protecting their borders against trespassing and potentially marauding Tajik smugglers, bringing over the border imported Afghan opium and whatever else they could sell. 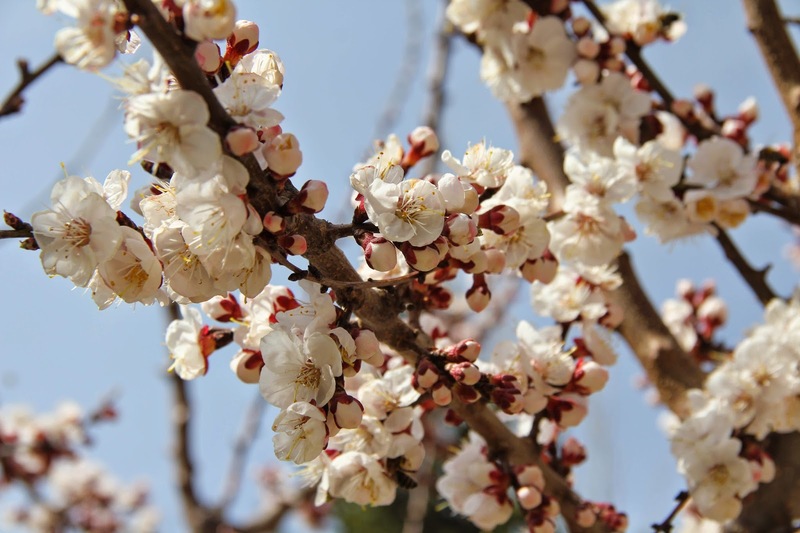 The next morning, I woke up excited to the sound of a car, the first we heard in 24 hours and the first we were about to hear for the next few hours. 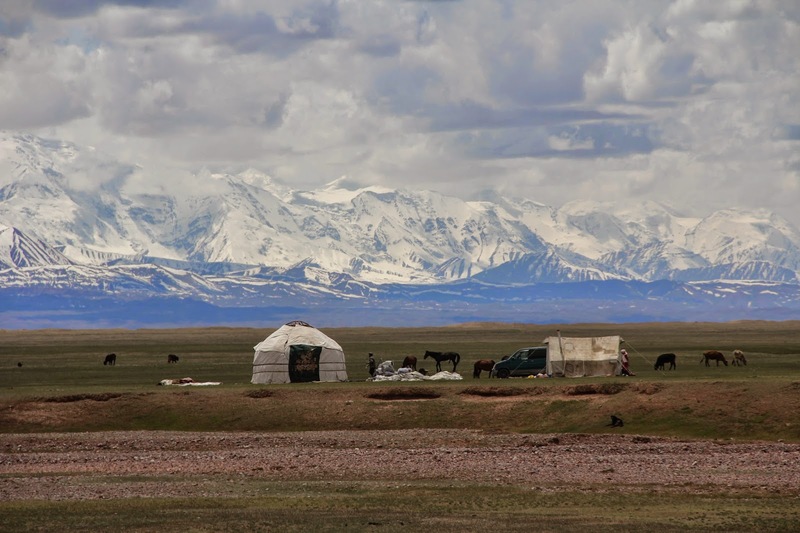 I jumped out of the tent and stopped Mamoush’s car, a Kyrgyz who was transporting a few veiled Kyrgyz women and a few men coiffed with their beautiful kalpaks. The first Russian words I was able to utter were: “Pomogite mne!”, ( “Help Me!”). After having carried for 35 kilometers this 15 kgs spare bag of supplies, needless to say that I was ecstatic to find for it an alternate mode of transportation. 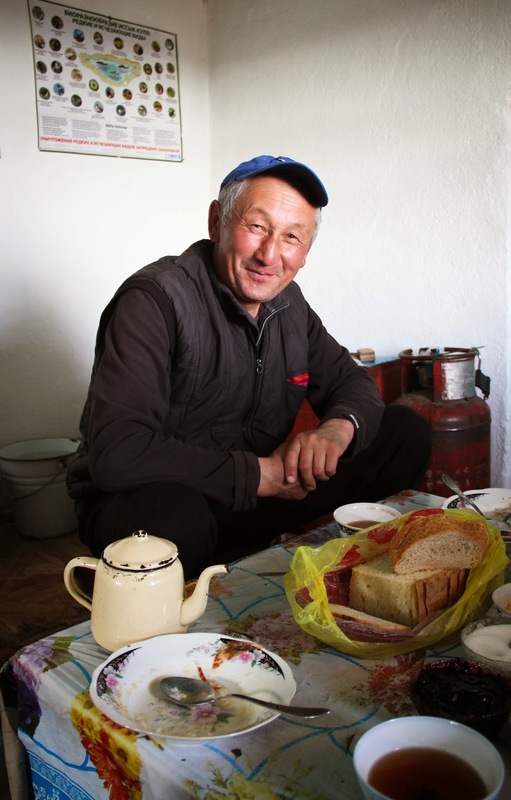 Mamoush agreed to take our bag 80 kms away, and especially two 4300 meters mountain passes further to a distant guesthouse on Lake Karakul and in exchange, accepted, upon our insistence, the modest sum of two hundred soms, (4$). 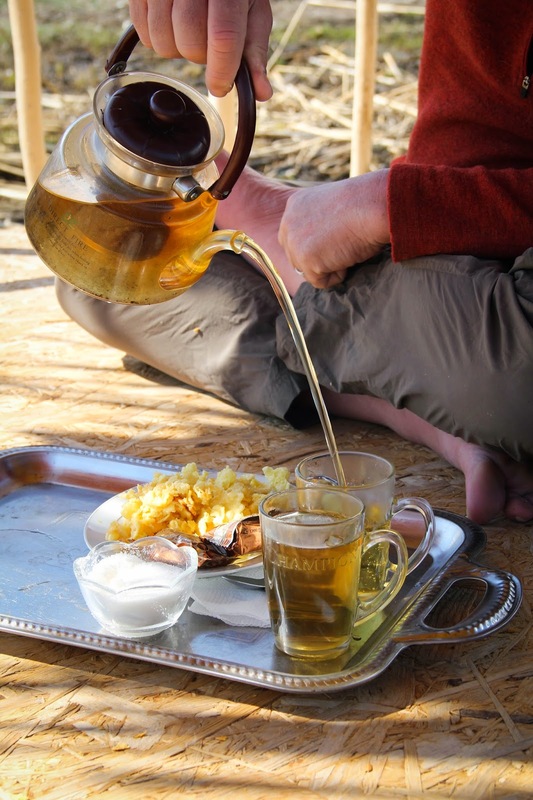 After Mamoush’s departure, relieved, we gleefully ate hot porridge for breakfast, packed our tent and remaining gear. 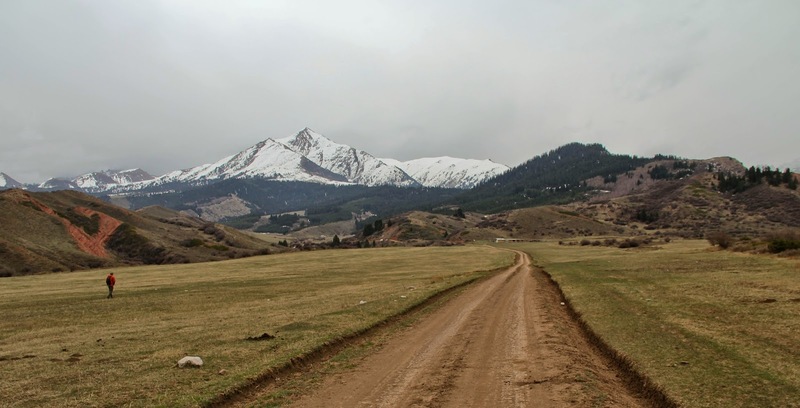 We then started cycling/climbing up hill on a muddy dirt trail towards 4300 meters Kizil Art pass. 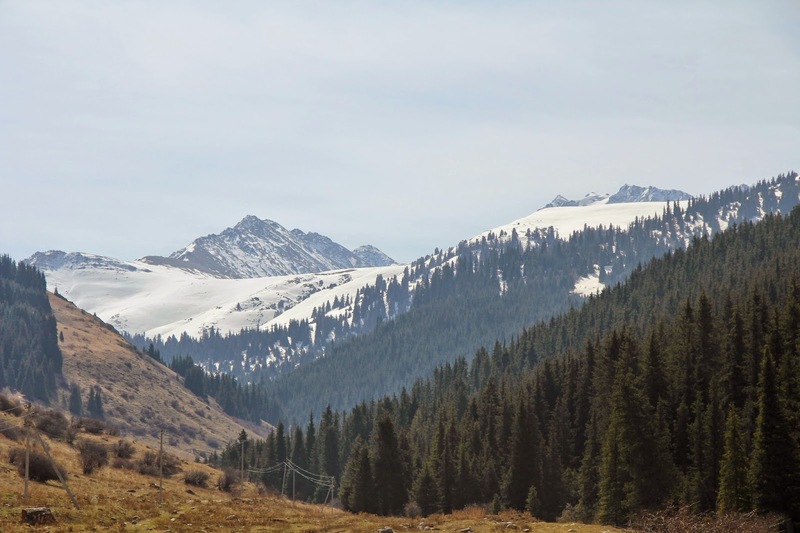 On our way up, we had the pleasure to be serenaded by a large amount of hissing intrigued marmots, busy staring at us, standing on their promontories, while eagles were circling above…. As we were climbing up, we came across two cars descending. 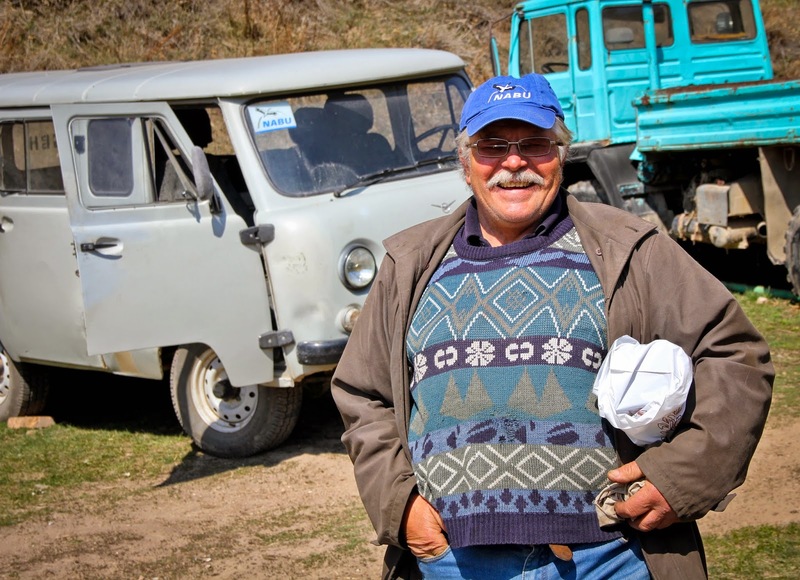 The first one was an older German couple in their large camper can who obviously did not want to mingle much, concerned with the potential protests ahead of them on the road, and eager to get to the civilized world of Osh after having spent a few weeks through the Pamir Highway. 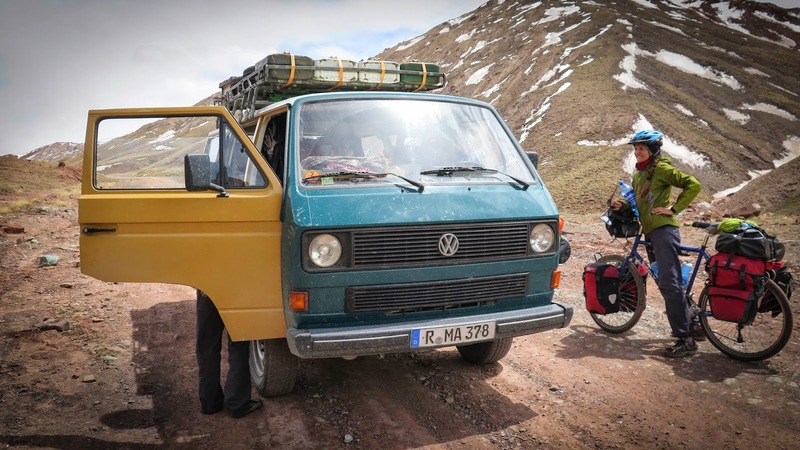 The second car was a VW Syncro 4*4 van driven by a younger German couple, Fabian and Verena, travelling peacefully through the region. 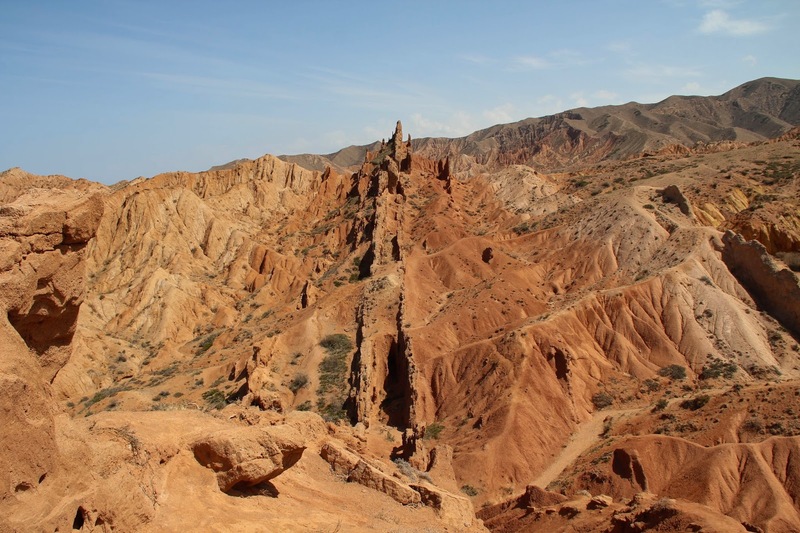 They had apparently quite enjoyed their time through Tajikistan and referred to it as “the end of the world”. Very kindly, they gave us two bottles of Tajik sparkling water. A bit further, at 4000 meters, and right before we were able to embark on the serpentine leading to the mountain pass, we came across three intriguing young kids and one father, inviting us for tea in their home, an old barrack built to house road workers / road menders in charge of maintaining the access to the mountain pass, throughout the year. We declined sadly an invitation for tea because we were both eager to make it to the mountain top and across the consequent border crossing, prior to the night. Right before reaching the mountain top, we came across an “expedition” of four Swiss motorcyclists, who were travelling Northbound with no gear or bags, while an escorting 4*4 vehicle was transporting it all. 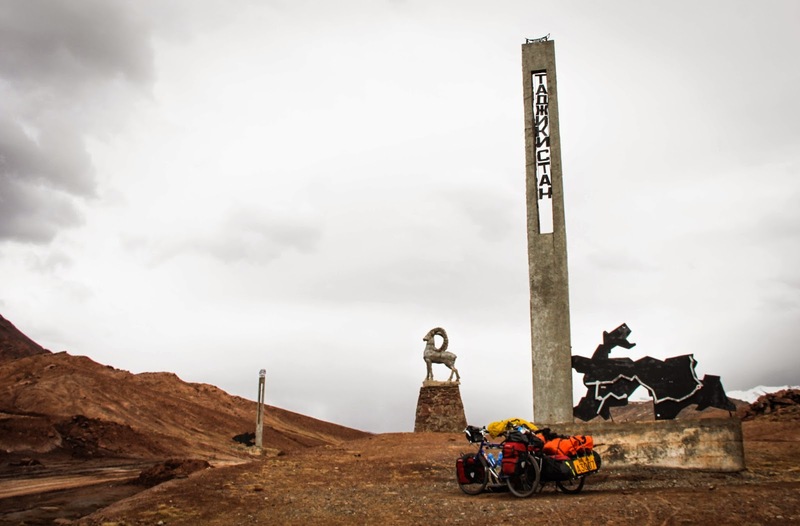 Somewhat out of breath, because of a bad cold and the increasing altitude, as well as feeling a bit disoriented, with our heads spinning, we finally pulled our loaded bicycles to the top of Kyzyl Art Mountain pass at 4300 meters. 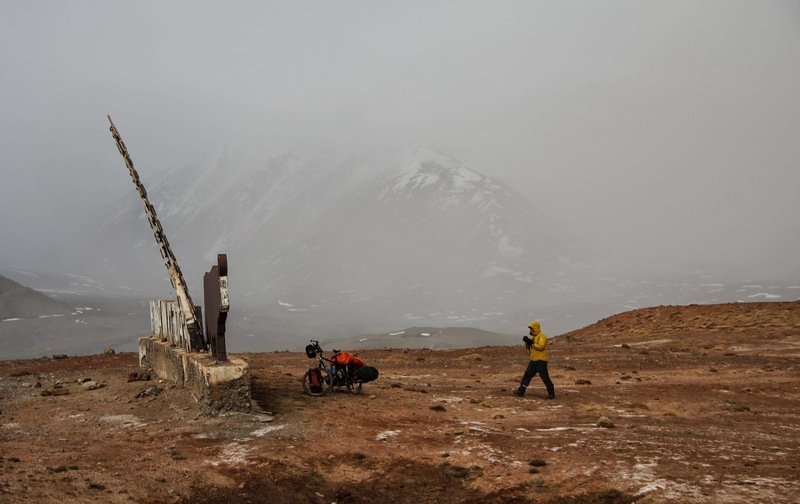 There, rejoiced, we filmed, took a few pictures, ate dried apricots and pistachio nuts, put on warmer clothes and proceeded further down to the Tajik border checkpoint, located 2 kilometers further down at 4230 meters. 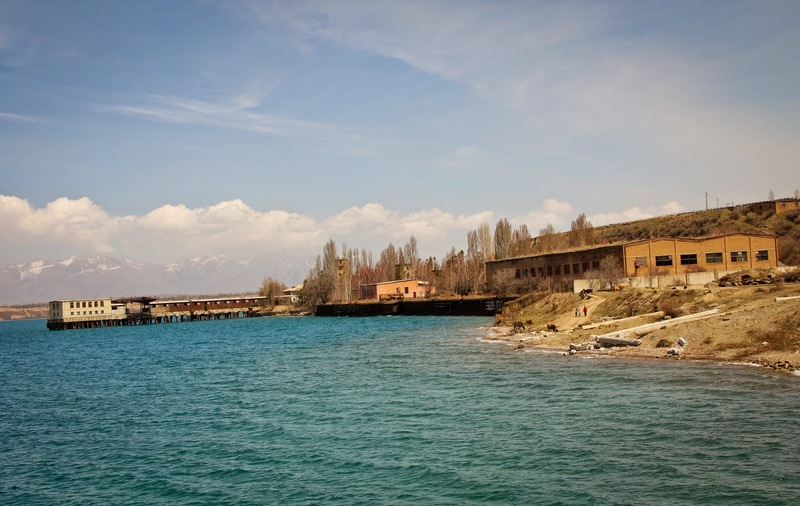 Right before the border post, we decided to take a few shots of the approaching Tajik barracks and tall structures. I also mounted on my head my GoPro camera in order to capture a bit the essence of this mountainous border crossing. 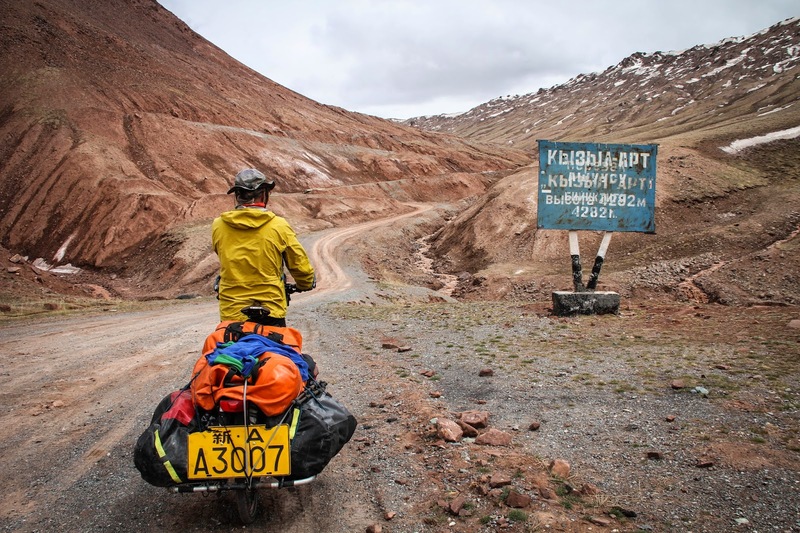 We started proceeding down further on a corrugated washboard road, where everything was vibrating on our bicycles. 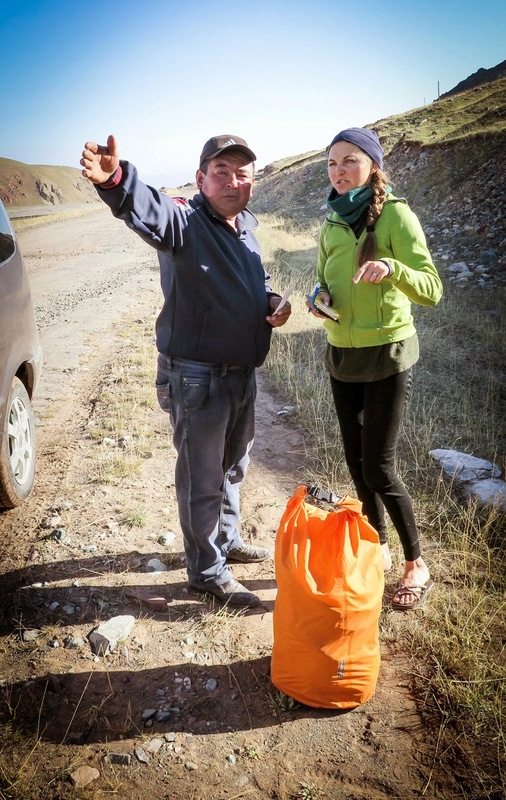 As a result, Gulnara lost a thermos bottle and a strapped water bottle which we were able to recover. Cycling further on, while I was busy reminding myself that I needed to check and tighten on that evening all of our bicycle rack bolts to prevent any loss, I saw Gulnara stopping ahead of me and scream: “I have a big problem!” She had indeed, this time, lost one of her bungee cord which had nudged and wrapped itself in the bicycle cassette. I stopped, looked at the mess, and was able to remove the bungee after having removed the wheel. Once again, this was a reminder that having bicycled thousands of kilometers on paved roads through China, Kazakhstan, and Kyrgyzstan , now that we were in Tajikistan, we were definitely back in washboard gravel-land, where EVERYTHING needed to be very well secured on our bicycles to avoid any potential loss and/or accidents. 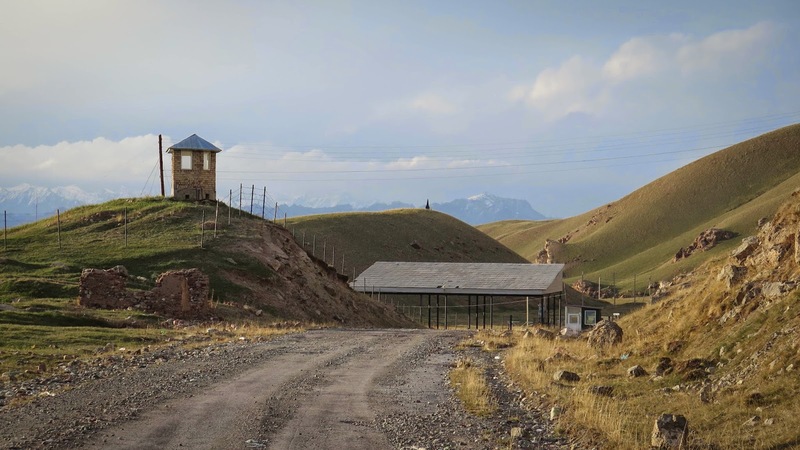 A bit further on, we started riding along the Chinese barbed wire fence, constantly reminding us that we were at the land junction between Tajikistan, Kyrgyzstan and China. 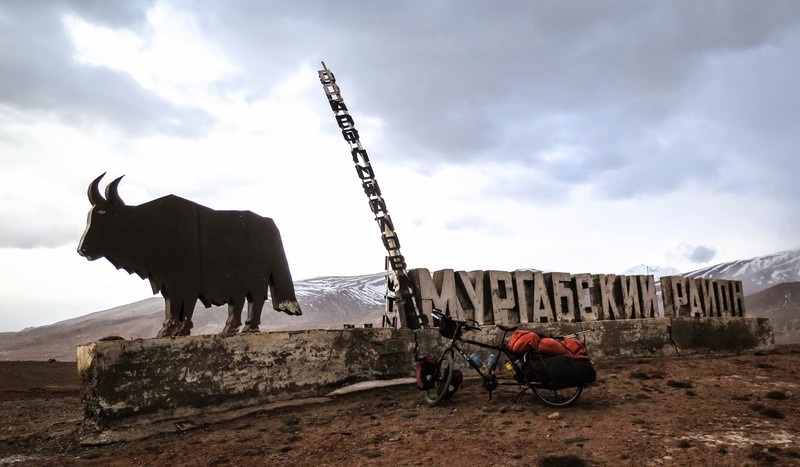 We quickly came across an interesting welcoming sign, decked with a magnificent iron yak where we started to feel indeed “welcomed” in Tajikistan by a few snowflakes and a stronger wind. At around 20h00, while I was busy securing our tent with pitches as hard I could into the soft sand we were camping on, Gulnara casually joked about how beautiful it would be of a spectacle if our tent flew into this magnificent wide and empty horizon…. We buckled down in our tent, ate ramen instant noodles and proceeded to quickly fall asleep. The next morning, unbeknownst that this was going to be a very challenging day for both of us, Gulnara and I ate and started packing down. In the process, I removed all of my bags out of the tent, and Gulnara proceeded to do the same. While she was busy folding our protecting MPI Space All Weather Blanket which we used as a floor mat inside the tent, and our Z-lite Therm-a-Rest mattresses, she turned around and left the empty tent unattended, which was by then un-pitched and without its 2d fly which had already been put away. Provoked by one stronger gust of wind, the possessed restless tent made then one little “bunny hop”, clearly got a running start and here she went…. Having been through a very similar experience, 12,000 kms away and four years ago while pulling a sled through southern Chukotka, with Yakut Nyurgun Efremov, I was stricken with horror! Nevertheless, overly optimistic, I started racing after my tent and yelled to Gulnara to chase it as well with her bicycle. As I knew, set in the right environment, our very robust 4 seasons Mountain 25 North Face tent can indeed become a beautiful kite, or more precisely bouncing like a giant tennis ball. 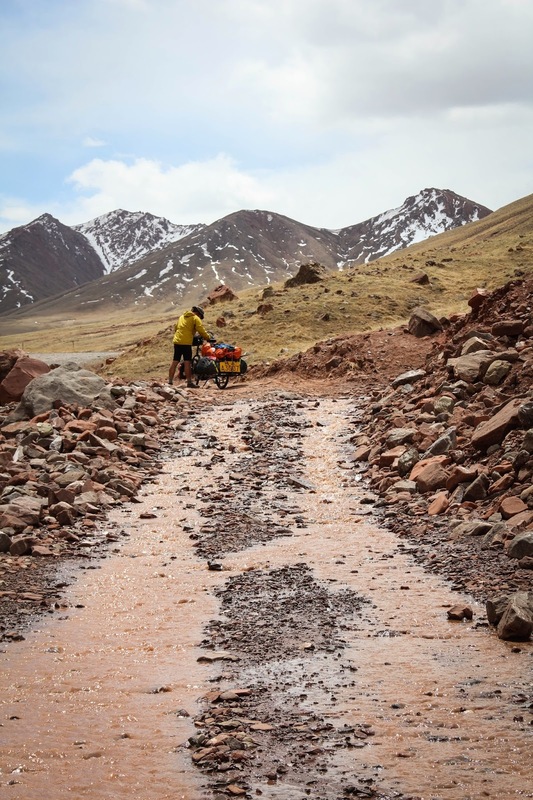 At 4,000 meters, with a bad cold, and somewhat out breath, I was definitely not able to gain some ground on this speeding flying tent and neither was Gulnara while riding slightly uphill on this corrugated washboard trail. My only hope was for this tent to land and somewhat nudges itself in one of the moon-like craters on this alkaline dry surface or against the Chinese barbed-wire fence…. 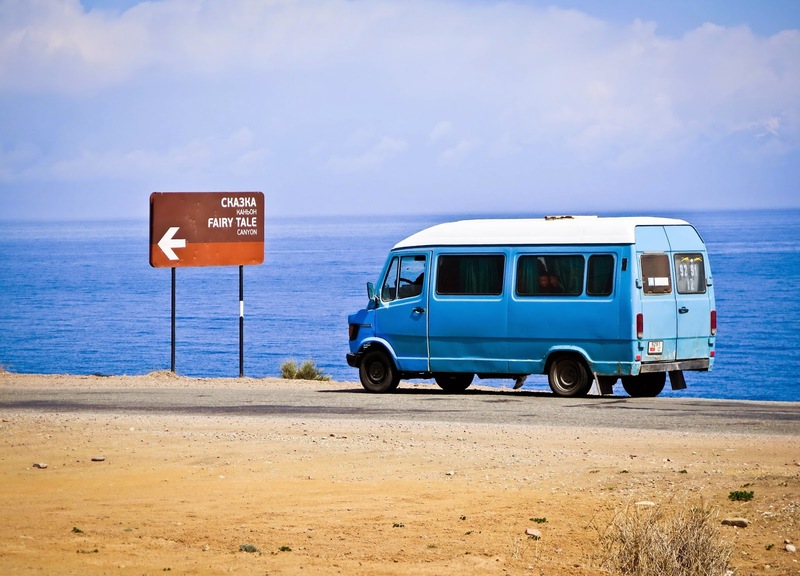 But, after about 40 minutes, came in my direction a couple, Briton Edward and Welsh Roslyn, aboard a huge ex-military “converted for recreational use” British camper truck, one big enough to facilitate the invasion of a Banana Republic of some sort. “That morning we spotted a man in a yellow coat walking along the most horrendous bumpy road ahead of us, on route to the border. He put his arm out to hitch hike. We stopped to give him a lift. The valley was massive, and we spent all morning helping them to find their tent. I sat with Gulnara for a little while, while Ed and Dimitri continued to look. 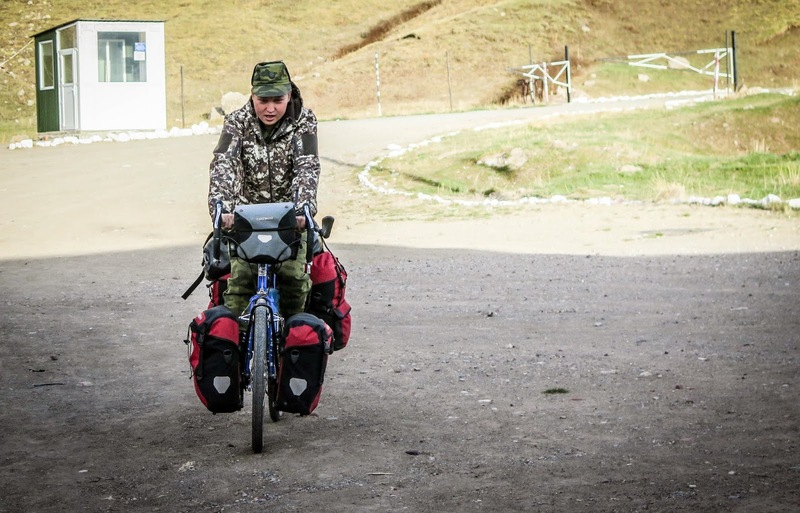 A Tatar from Russia, who was joining her husband on part of his round the world trip, cycling from Bishkek (Kyrgyzstan) to Dushanbe. Sadly the tent (which was bright yellow) was never recovered and we wished Dimitri and Gulnara good luck on their trip. 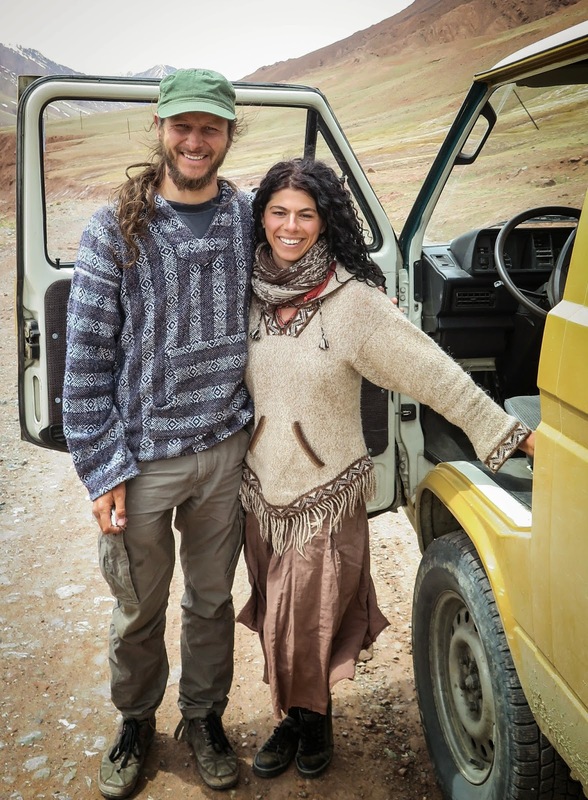 We are very thankful that Edward and Roslyn took so much time out of their journey to help us search for this tent in every nook and corner of this vast plain as well as offered us cold medicine and water. 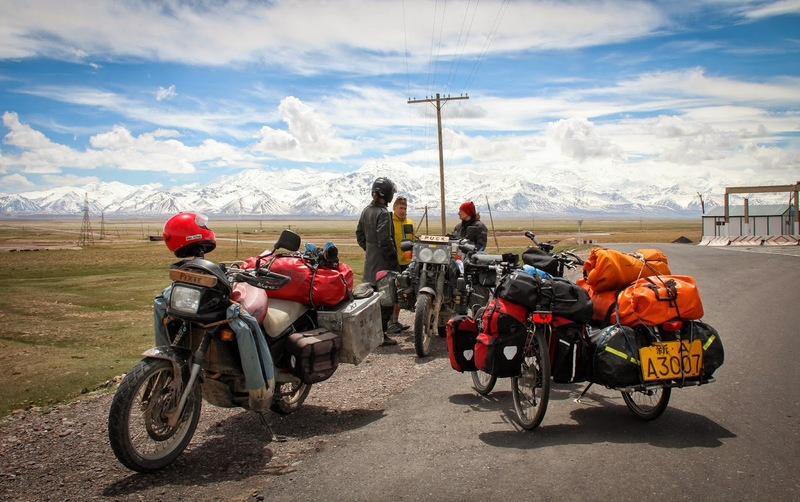 Wishing them the best for the continuation of their overland journey to Magadan! 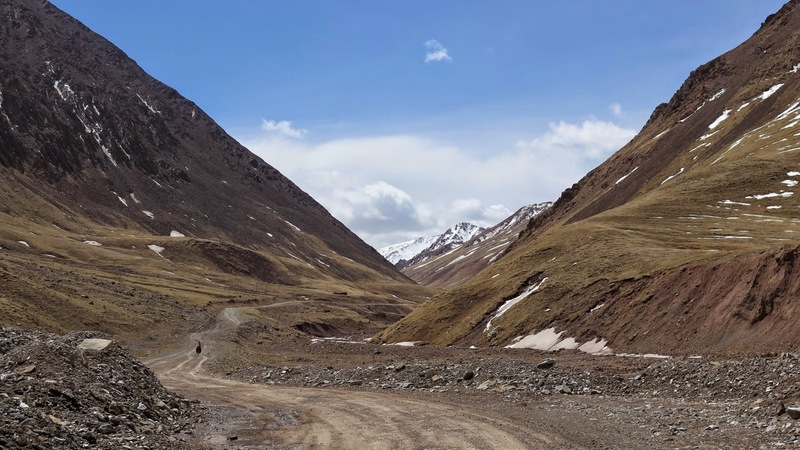 Undeterred by our “tragic” material loss, Gulnara and I decided then to push forward south into Tajik territory, towards Lake Karakol, which was 58 km and another 4300 meters mountain pass away. 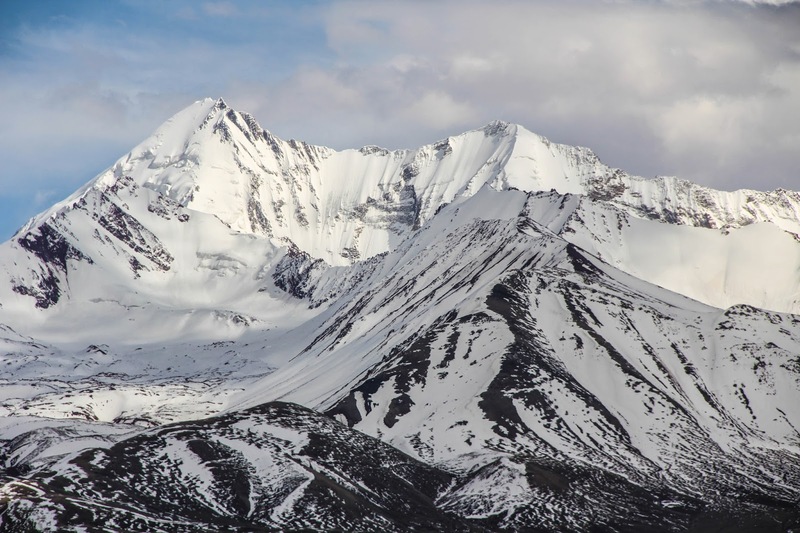 Knowing that the weather could change rapidly at this altitude, we were preparing ourselves mentally at the idea of spending a night tent-less under the potential falling snow. After 500 meters of intense corrugated washboards, my B17 Standard Brooks bike seat collapsed for the sixth time. 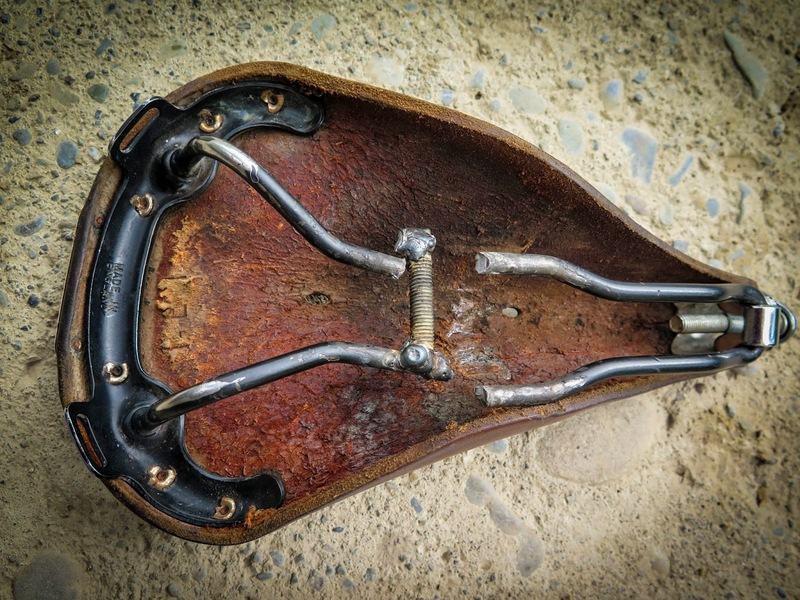 Indeed, I have had problems with the metal brackets underneath my bike seat ever since I inadvertently yanked on it with all my strength in order to get my bike out of the deep Mongolian mud in August 2013. A dumb move I regret until this day. 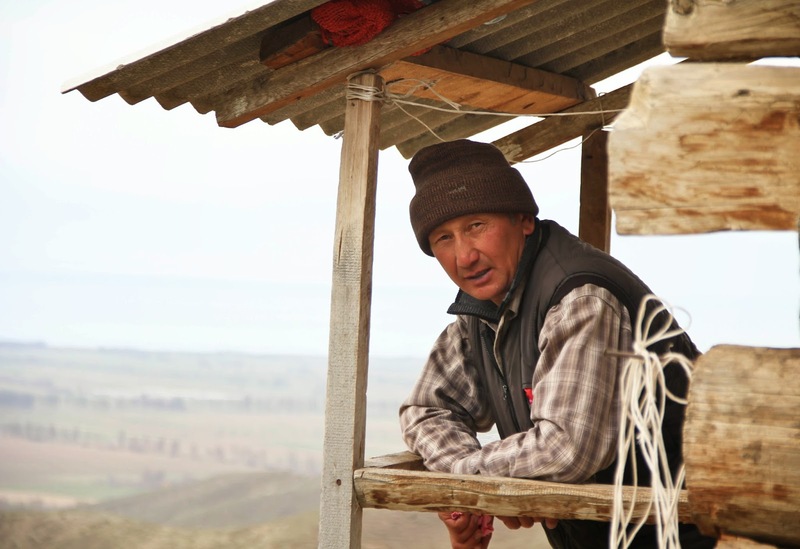 I had the brackets underneath the seat welded together then and all of this held well, until a few weeks ago, when the welding broke apart upon reaching the Northern Kyrgyz city of Kara-Balta. Since then, unable to find a replacement bike seat “on the road”, I have had four different welders progressively amending this seat as best as they could. But this time, enough was enough! As we were embarking on hundreds of kilometers of corrugated gravel trails, I understood that the show could not go on and I needed badly to get a new seat! 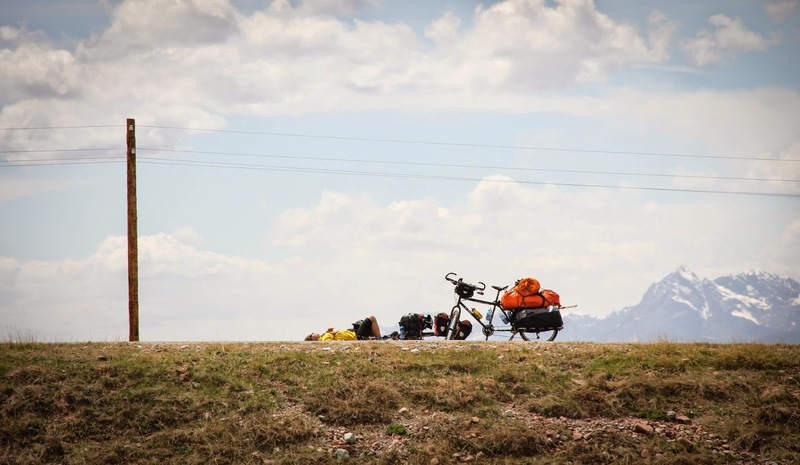 This is when we decided to turn around and move back towards Osh, Kyrgyzstan where we could order a new tent, a new bike seat and take care of our bad cold which was rapidly gaining on both of us. 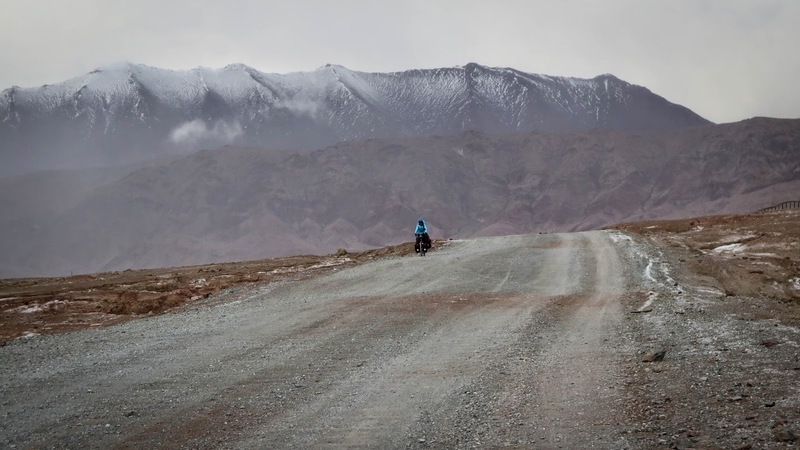 We started cycling back towards the Tajik border when we were suddenly pounded with a snow storm combined with a strong head wind. At that point, knowing that the expedition had come to a halt where we had lost our tent, we decided to hitchhike back for our retreat when we came across one of those famous UAZ-452 mini-buses (‘Uazzik’) on its way from Murgab (Tajikistan) to Sary-Tash (Kyrgyzstan) with on board a large Tajik ethnically Kyrgyz family. That was our call! We stopped this uazzik, stuffed our bags and Gulnara’s bike in the back, while we strapped my long bicycle on the roof. The driver Tadjibay agreed to take us all the way back to Sary-Tash, across both borders checkpoints. 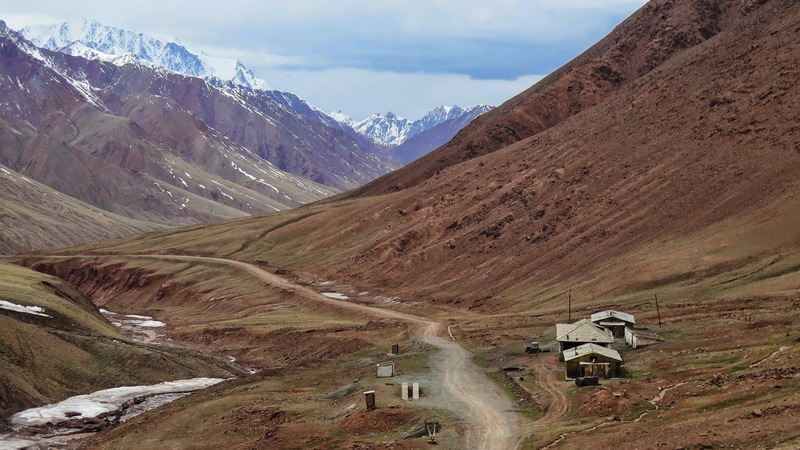 On our way, the amused Tajik customs officer, recognizing us, was of course very keen on telling us a Russian equivalent of “I told you so”, clearly reminding us how much he had warned us of the Death Valley’s winds, and offered a place to spend the night…. 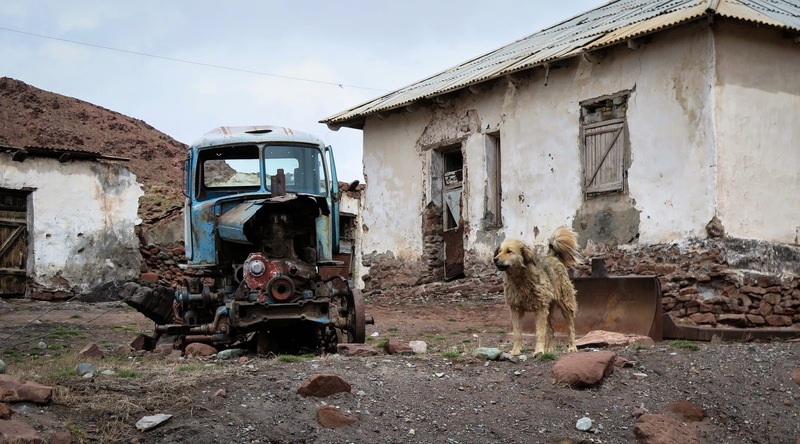 With our tails between our legs, full of shame, we proceeded forward to the town of Sary-Tash, where we were able to hitch-hike a ride the next morning all the way to Osh. 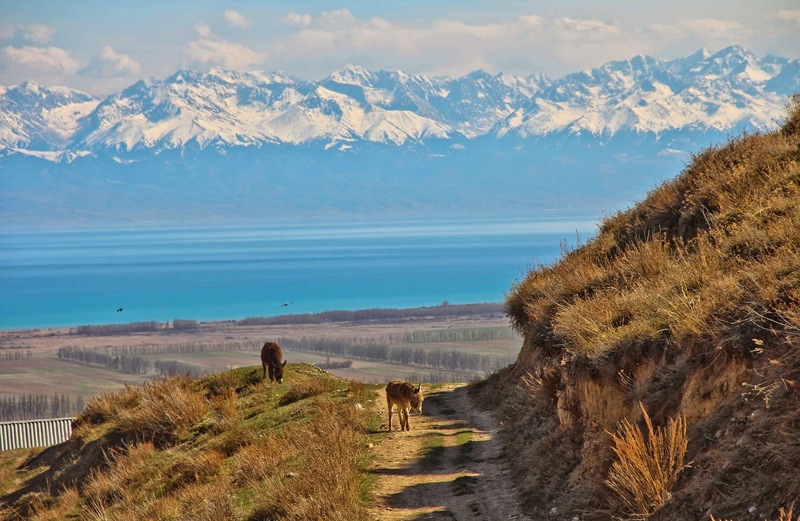 We now have been back for a week in Osh, Kyrgyzstan, licking our “wounds”, taking care of my bad cold with strong antibiotics. 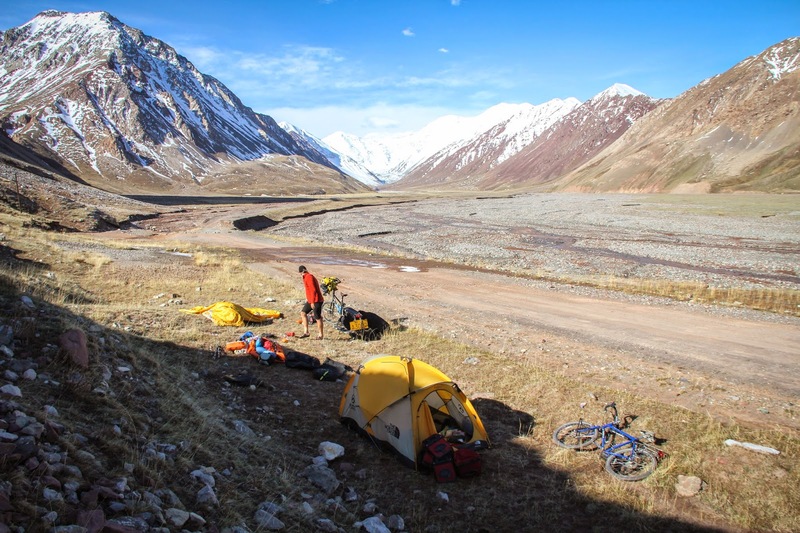 Our new tent and bike seat just arrived on a cargo flight from Moscow, (thanks to the tremendous help of Gulnara’s brother Marsel and his wife Olya), where the shipping process has been nothing but complicated…. 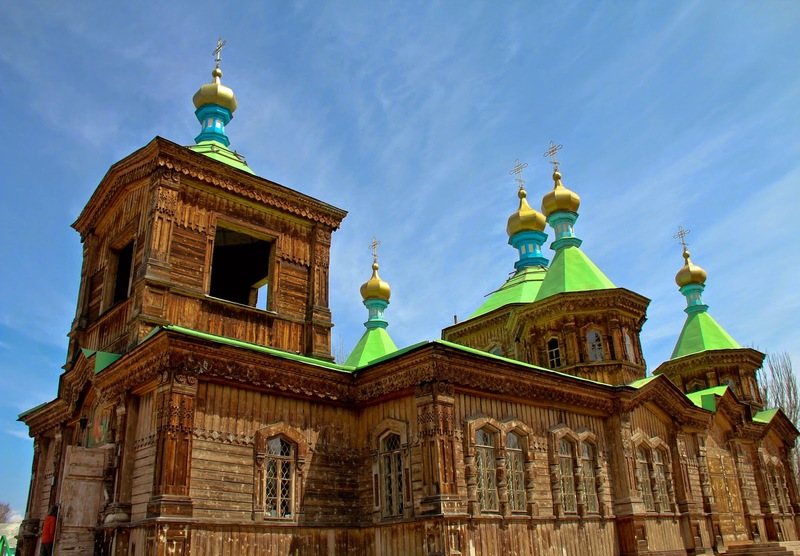 Having said that, we can say that this Moscow-Osh cargo route is actually the fastest and cheapest solution to obtain a new sturdy tent and bike seat. Better indeed than shipping it from Europe/US or considering buying any of the alternate products available in Osh or even Bishkek as my warmshowers friend Nathan researched. One caveat though: be aware that for example the company "The North Face" has no official representative in Russia and you could be potentially picking up a fake product, if you are not careful. 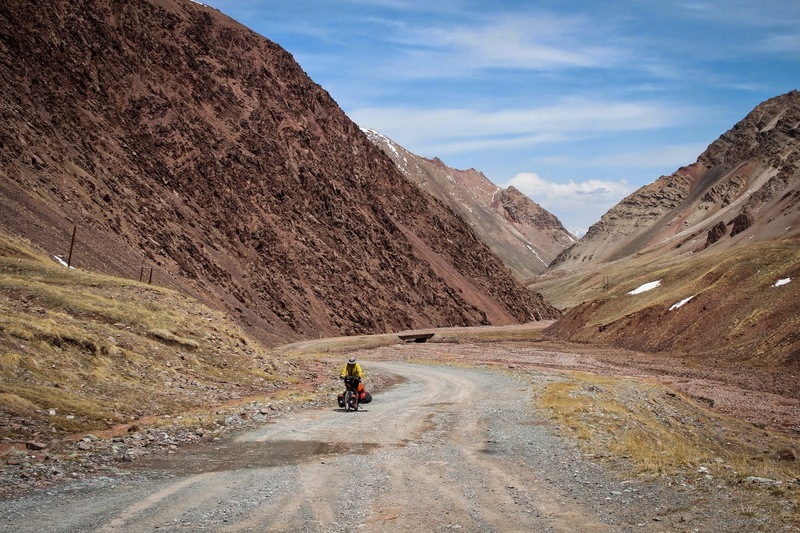 If all goes well, we should be back in Tajikistan in the next 48 hrs where we last stopped, ready to proceed further South on this infamous Pamir Highway… So long and Happy trails to you! 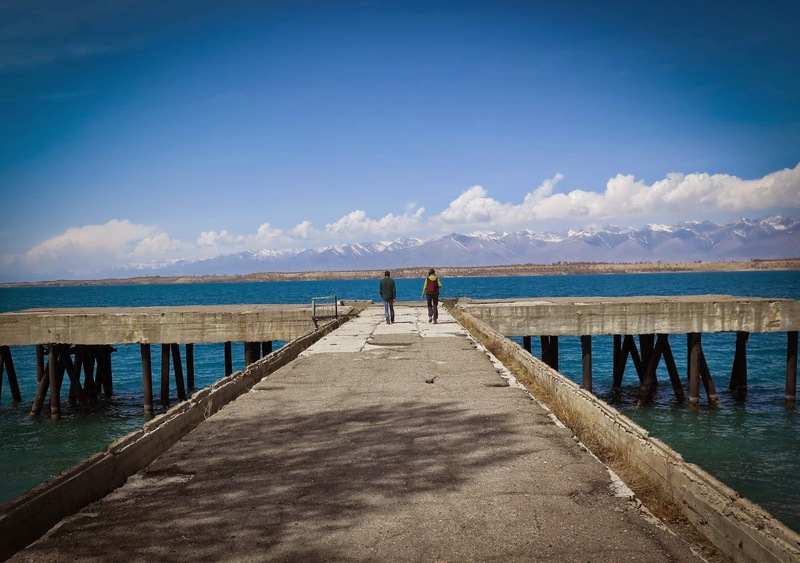 In mid April, while waiting for our Tajik and Afghan visas in Bishkek, Kyrgyzstan, and before we could start cycling south, we had the opportunity to be able to go and tour the glorious Lake Issyk. Over 170 kms long and 70 kms across, it is the second-largest alpine lake in the world, after Lake Titicaca in South America. 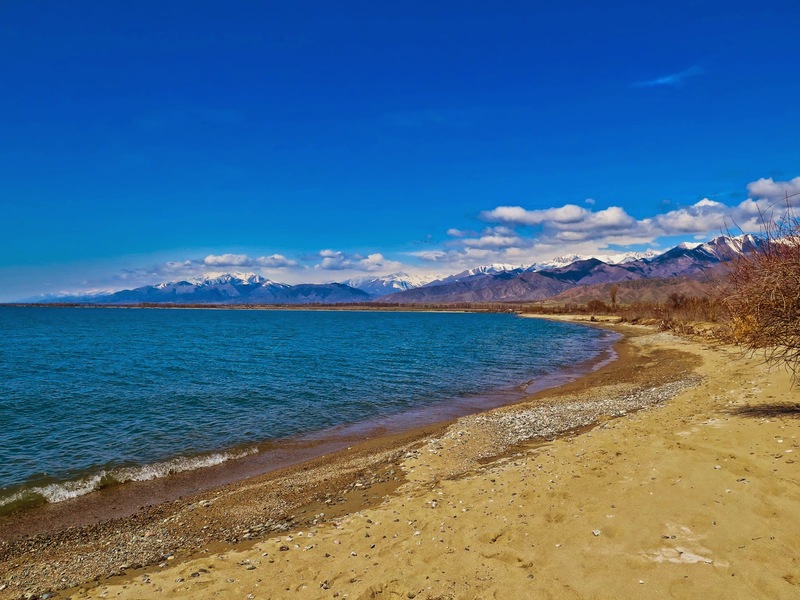 Its name Issyk-Köl, means "hot lake": a combination of extreme depth, thermal activity and mild salinity ensures the lake never freezes. Its moderating effect on the climate, plus abundant rainfall, have made it something of an oasis through the centuries, a force of nature! 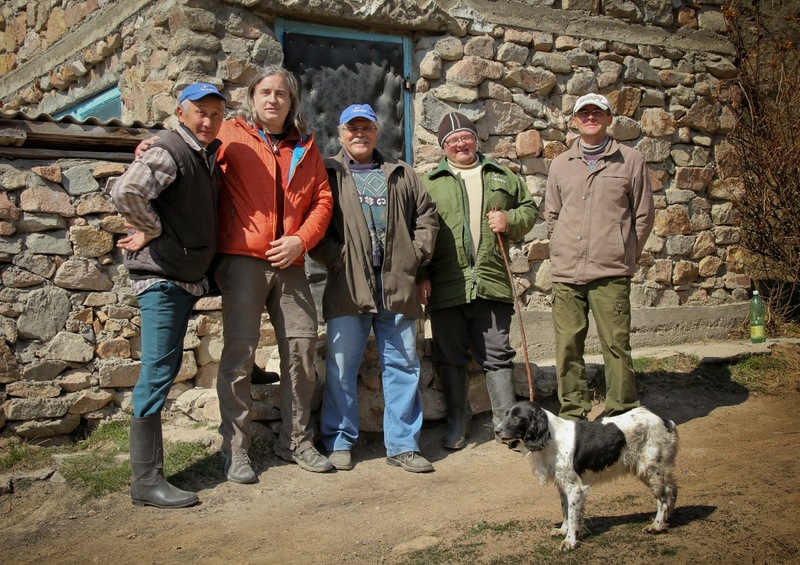 We first went directly to visit our NABU friends on the northern side of the lake, near the kyrgyz village of Anan'yevo, In January 1999, the NABU established an anti-poaching unit for the conservation of the snow leopard: the "Gruppa Bars". 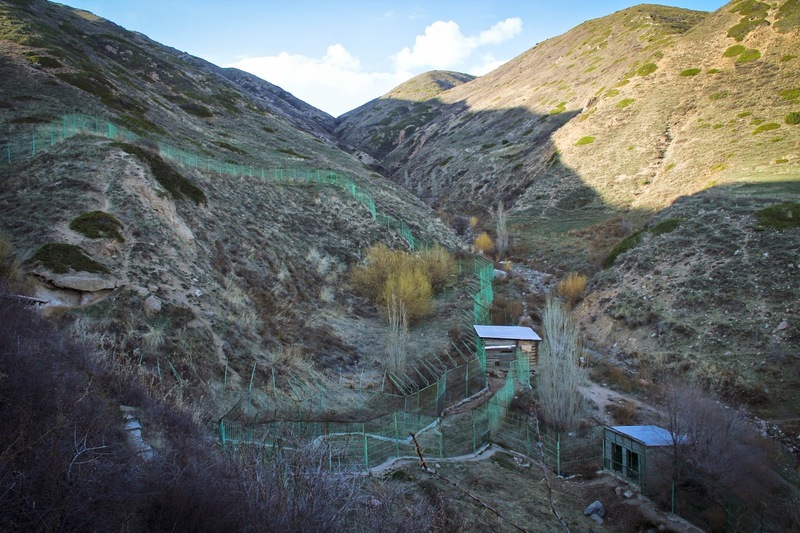 It has already confiscated scores of snow leopard skins and bones and freed three living snow leopards from foothold traps. 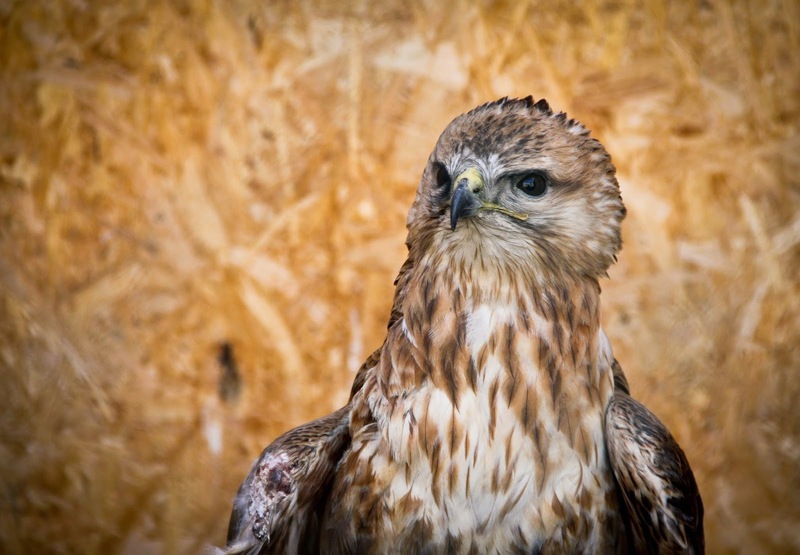 Dozens of poachers have been arrested and convicted. 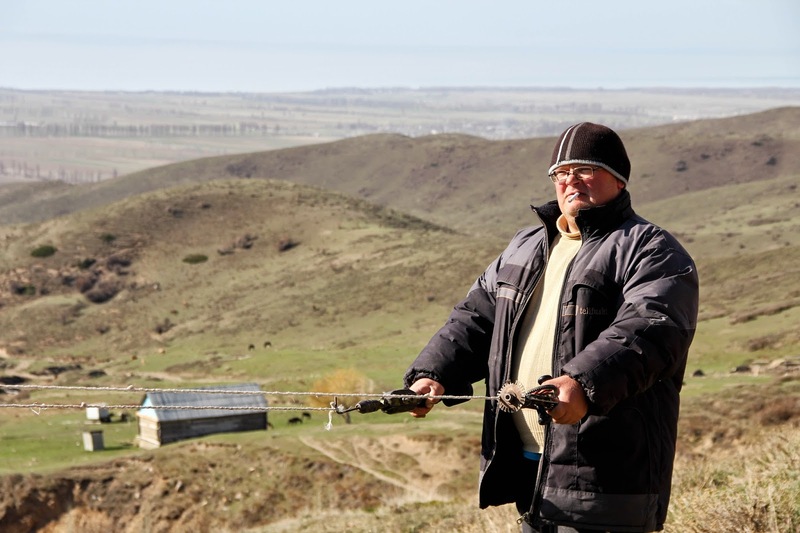 In the patrol area of the "Gruppa Bars", poaching has declined significantly since then. 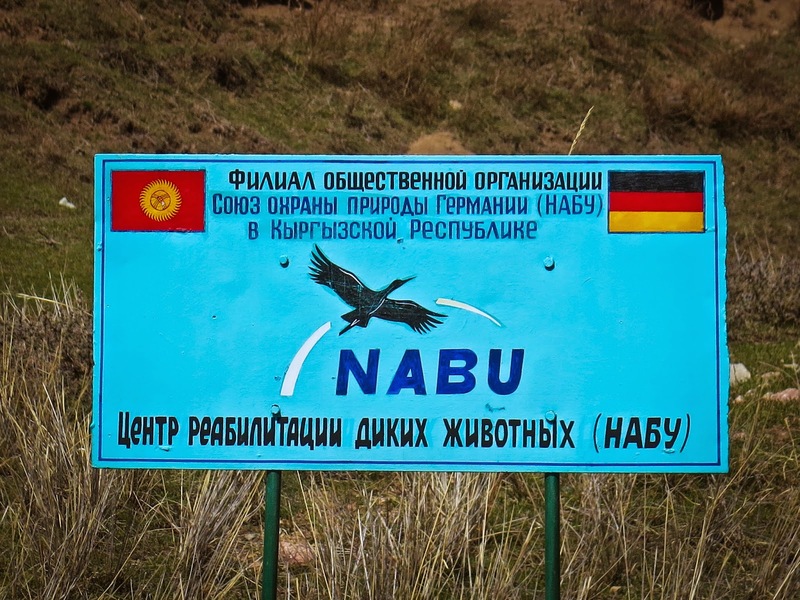 Our NABU friends were very kind to invite us to spend one night at their "Rehabilitation Center of wild animals", where they operates the world's largest outdoor enclosure for snow leopards. 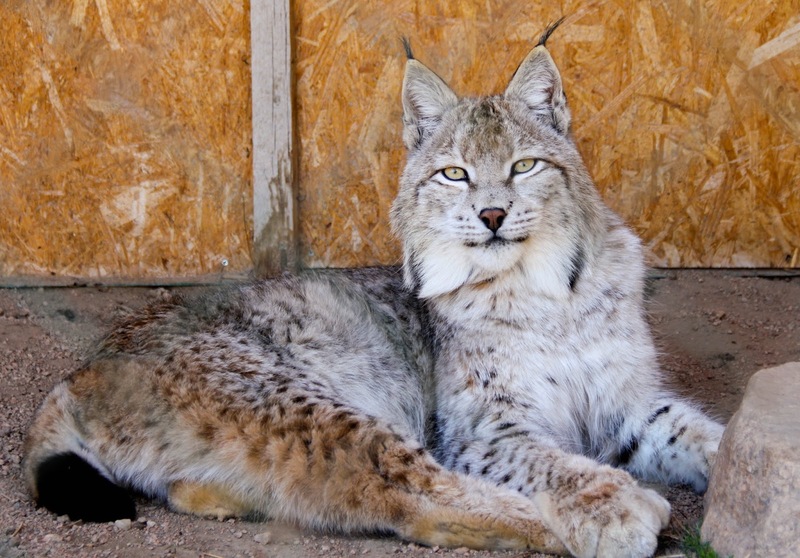 The two snow leopard ladies Alcu and Bagira have been at home here since 2002. 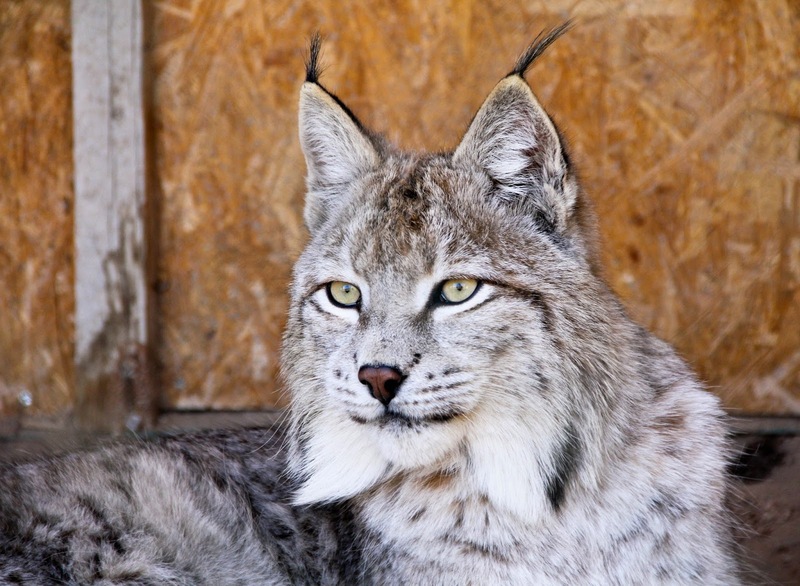 In the following year, they were joined by male snow leopard Kunak. 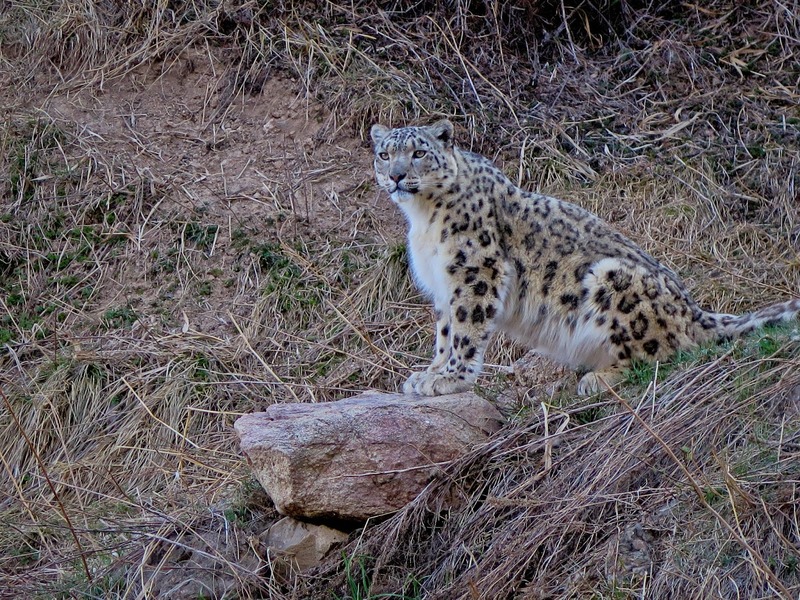 All three were saved by the "Team Snow Leopard", but the injuries they had suffered from the poachers' foothold traps made it impossible to return them to the wild. 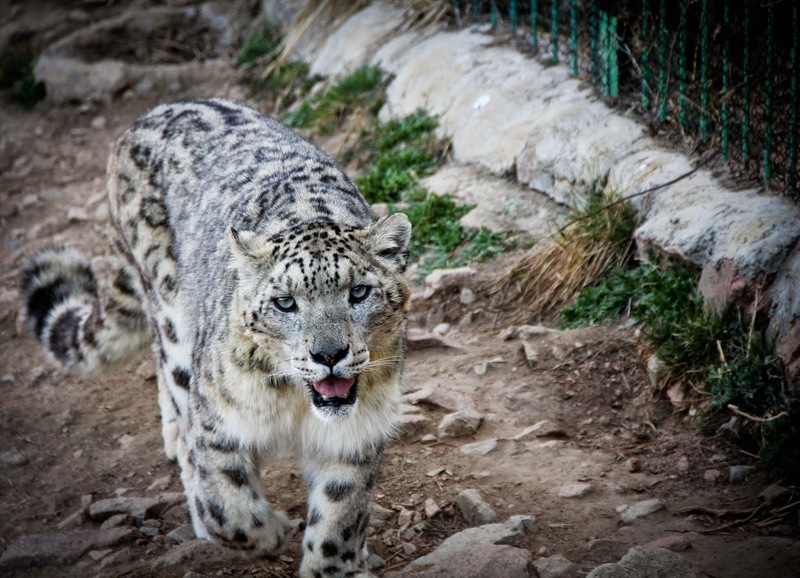 At an altitude of 1,850 metres and on an area of about 7,000 square metres, the three snow leopards now have enough space to roam. In 2009, they even gave birth to two cubs, Kolyuchka and Fialk. 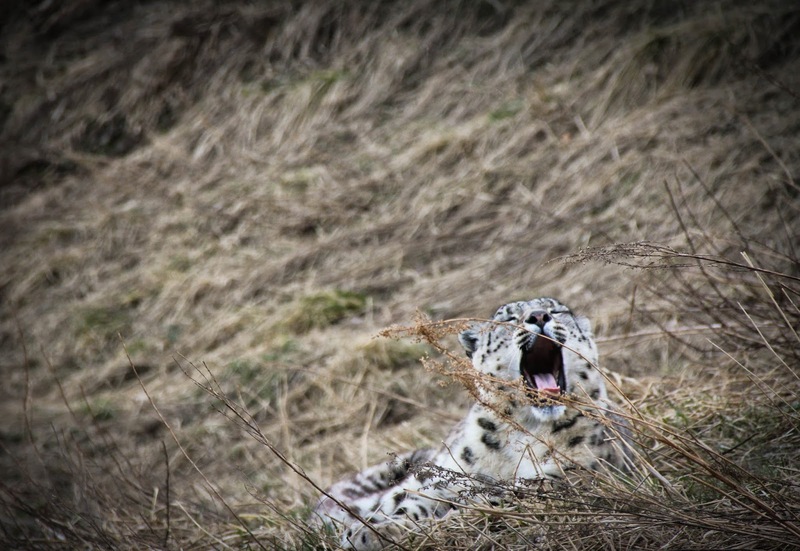 One interesting fact we learnt was how the increase in cashmere production directly impacts the life of snow leopards. 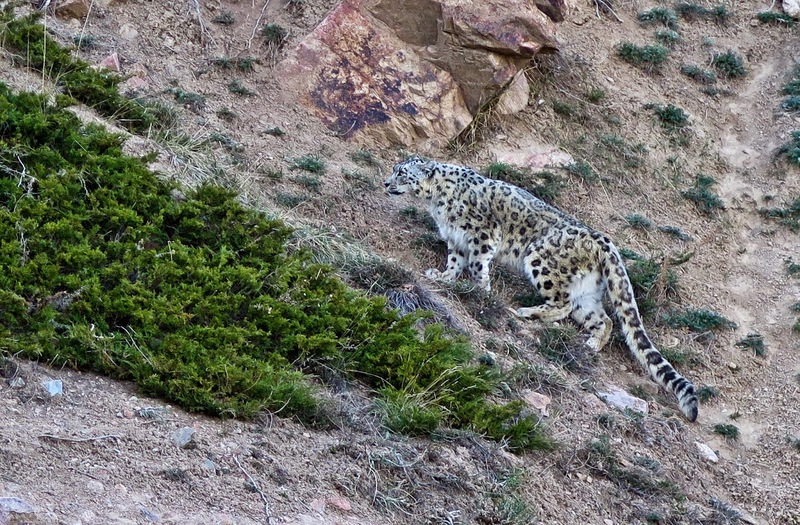 National Geographic recently stated: "A new study by the Wildlife Conservation Society (WCS) and the Snow Leopard Trust suggests that the booming trade in cashmere is causing Central Asia's goat herders to expand their stock in search of increased profits. 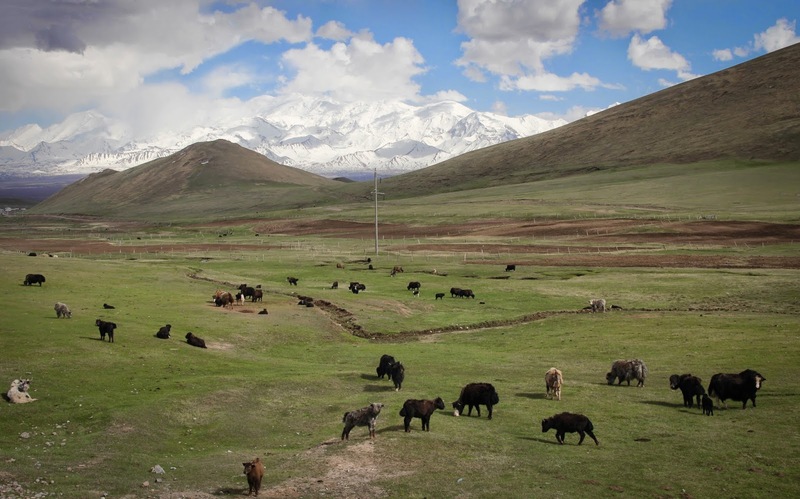 This creates a welcome economic boost, but an array of rare or endangered species like snow leopards, Bactrian camels, and Tibetan antelope are paying the price. 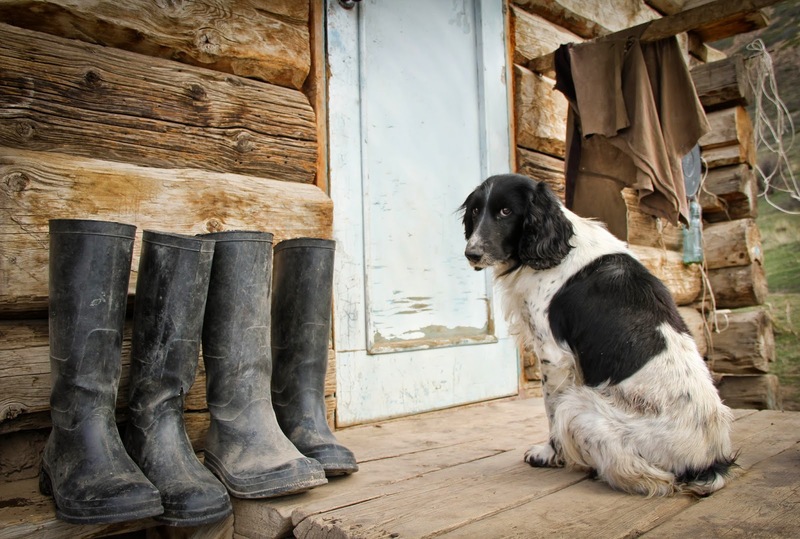 Wild habitat is shrinking dramatically, and the animals are increasingly coming into conflict with humans and their livestock." We had the pleasure to spend two meals with guards/caretakers kyrgyz Assubek and russian Sergey, learning about what their lives and dangerous work entail as well as listening to them reminiscing the Soviet days when Lake Issyk was off limits to foreigners, while guests from all over the USSR used to come and rest in health spas, lined along its shores. 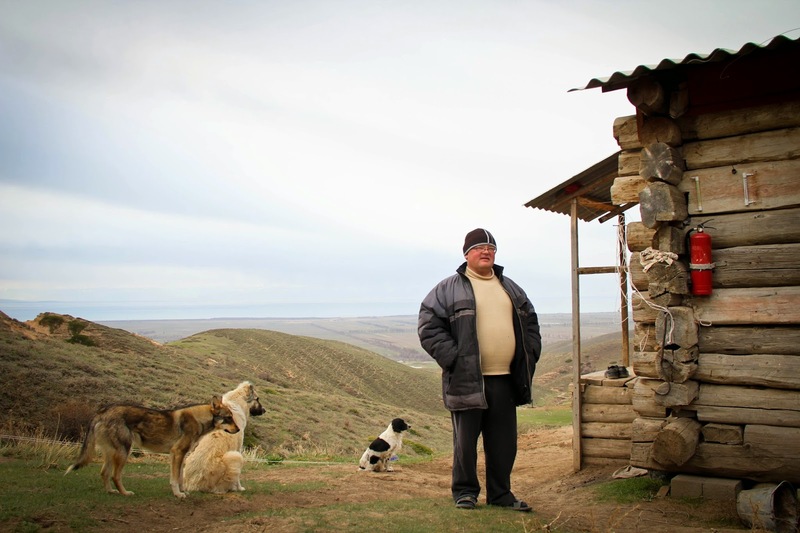 It was especially interesting to learn from Viktor Kulagin, the director of this rehabilitation center, the struggles he constantly faces from the local population, not fully comprehending the necessity of an ecological center in a country where a section of the population is itself, not very well nourished. 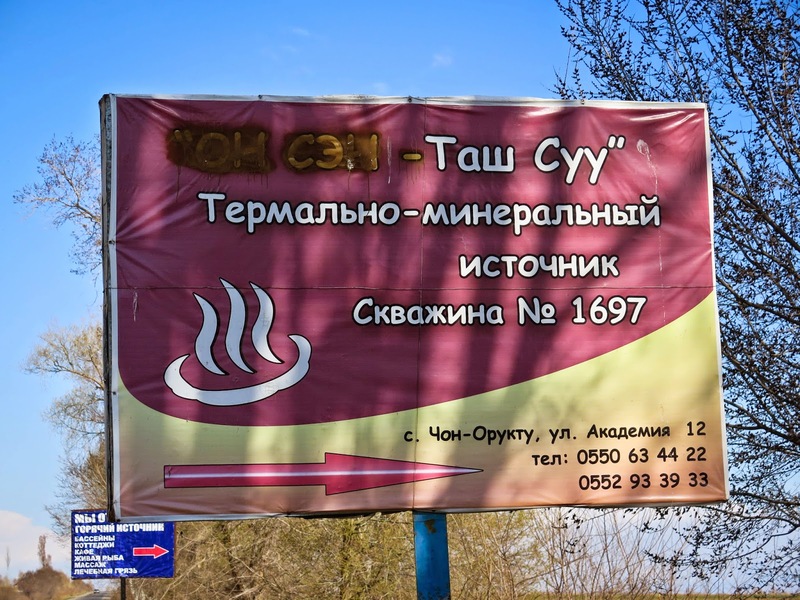 After having spent 24 hrs at the rehabilitation center, Viktor offered us to drive us over to the nearby hot springs in the village of Chong-Uryukty , (чон орукту горячие источники) where we were able to alternate between dipping into the hot springs and enjoying a swim in the "refreshing" nearby majestic Issyk lake. 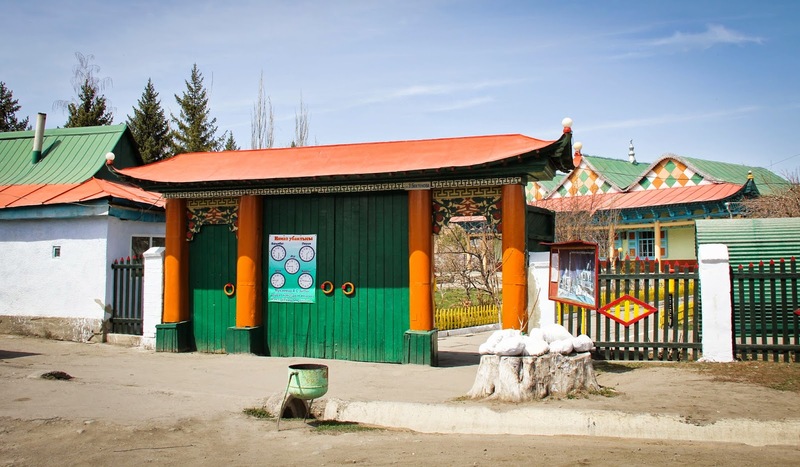 We spent the next day, visiting Karakol and its surroundings. 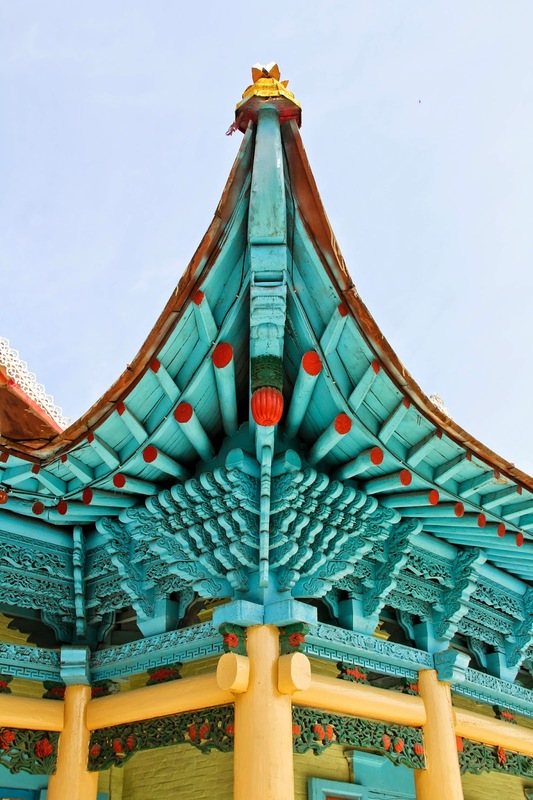 Karakol, a bustling town, is the administrative capital of Issyk Kul Province where Kyrgyz, Chinese muslim Dungans and orthodox ethnic Russians have cohabited since 1864. 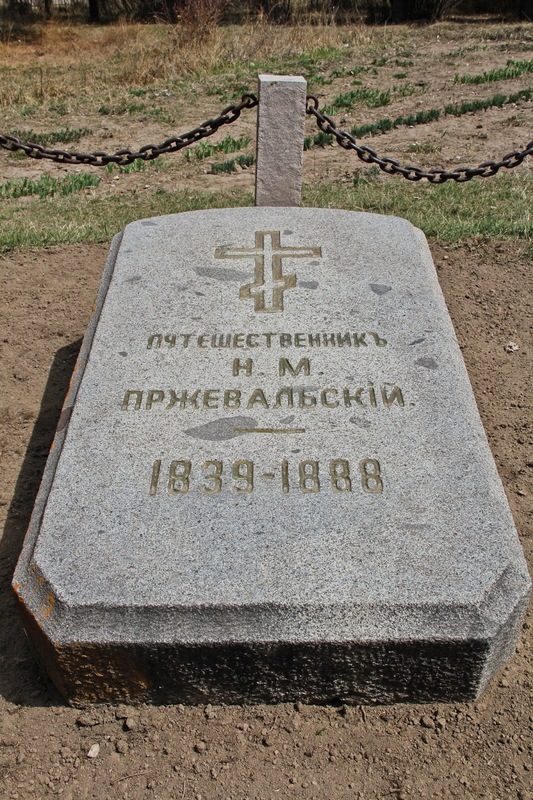 While in Karakol, we also had the pleasure to visit Nikolay Przhevalsky's Museum and Memorial, where the great Russian explorer was rested in peace. 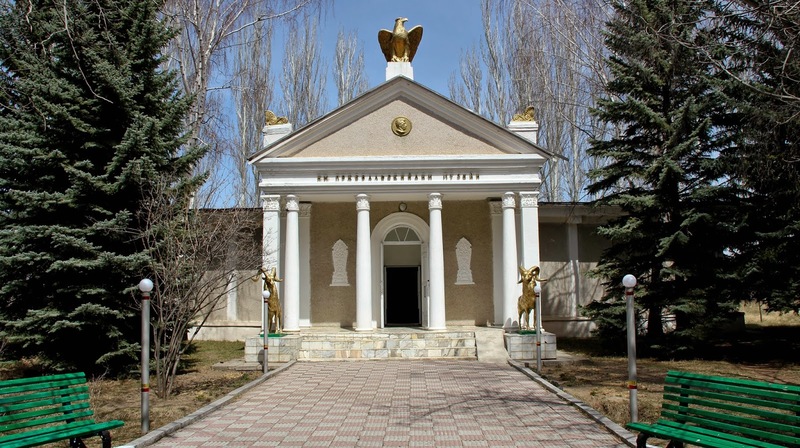 An intriguing place where we could further acquire knowledge on his great travels, research and exploration throughout central asia and far eastern russia. 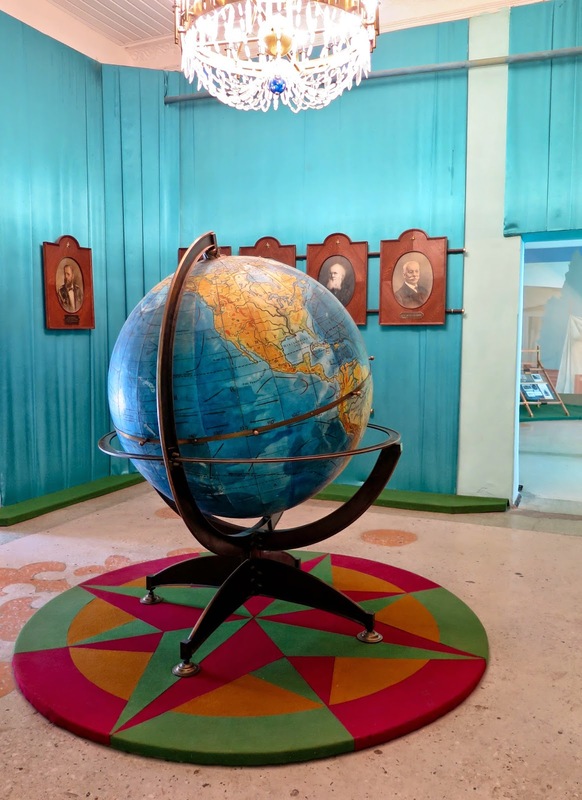 Near this museum, we were able to spot in the Mikhaylovka inlet, an entire polygon or military-research center complex where the Soviet navy used to test high-precision torpedoes, far from prying western eyes. 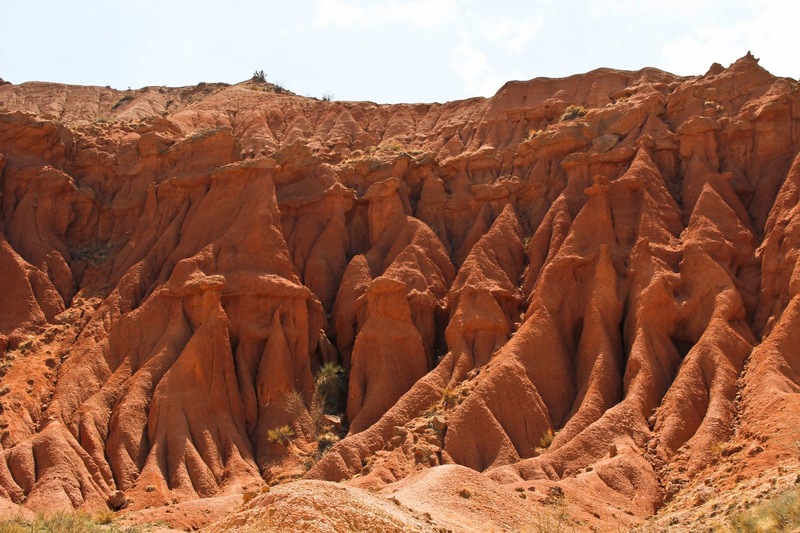 On our third and final day, we were hiked around the Jeti-Ögüz Rocks, and extraordinary formation of red sandstone cliffs. 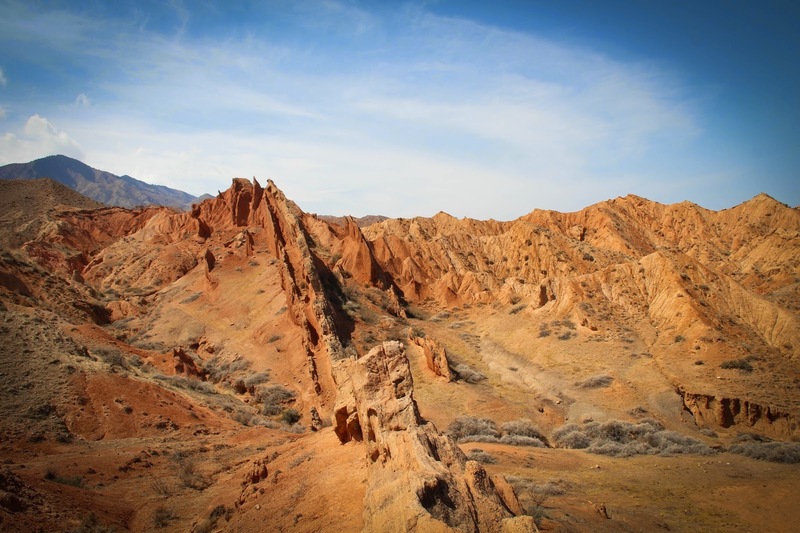 Finally, we were able to hike in the magnificent Fairy Tale canyon "сказка каньон" before returning to Bishkek. 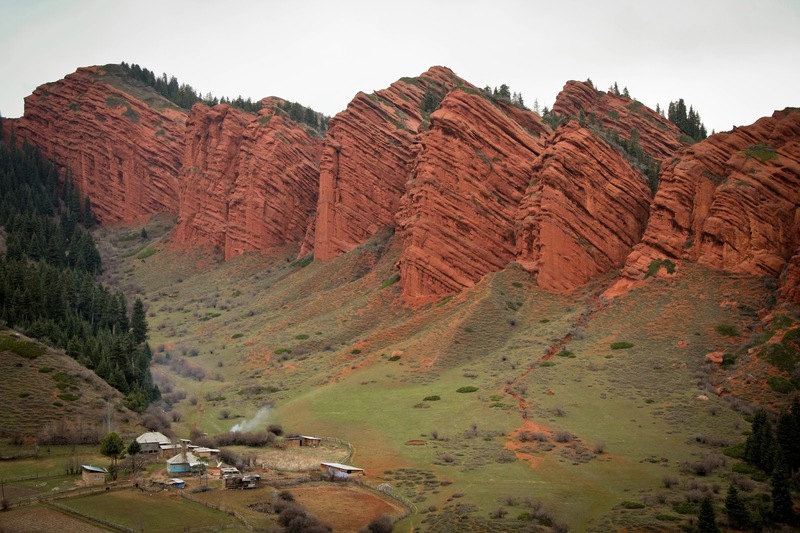 In the Kyrgyz Republic (Kyrgyzstan), we will start cycling south on April 28th on M41 and plan to pass the Kyrgyzstan-Tajikistan Border at Bor - Dobo - Kyzyl Art Pass around May 23rd 2014. 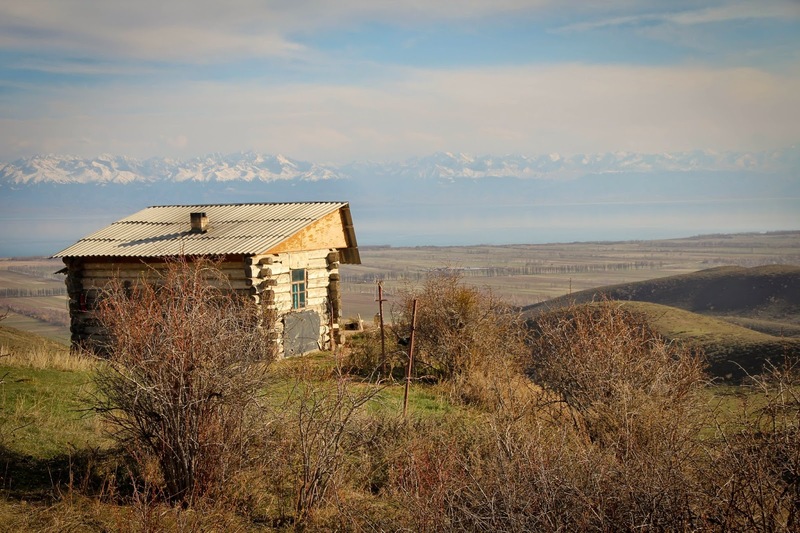 We foresee to cycle through the towns of Bishkek, Sokuluk, Belovodski, Kara Balta, Otmok, Toktogul, Torkent, Ketmen-Jöbö, Karaköl, Tash Kömur, Kochkor-Ata, Massy, Bazar-Korgon, Jalal-Abad, Ozgön and Osh. 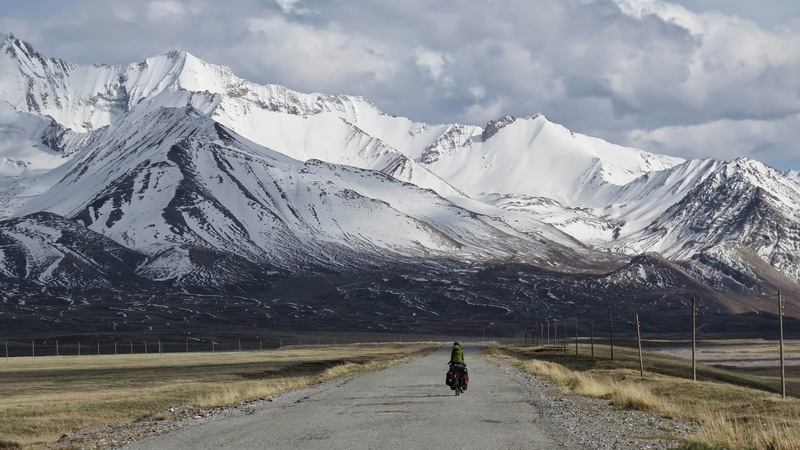 In Osh, we will start cycling on the famous Pamir Highway (M41), also known as the "Roof of the World", where we will be "climbing" through mountain passes as high as 4600 meters (15,000 feet). 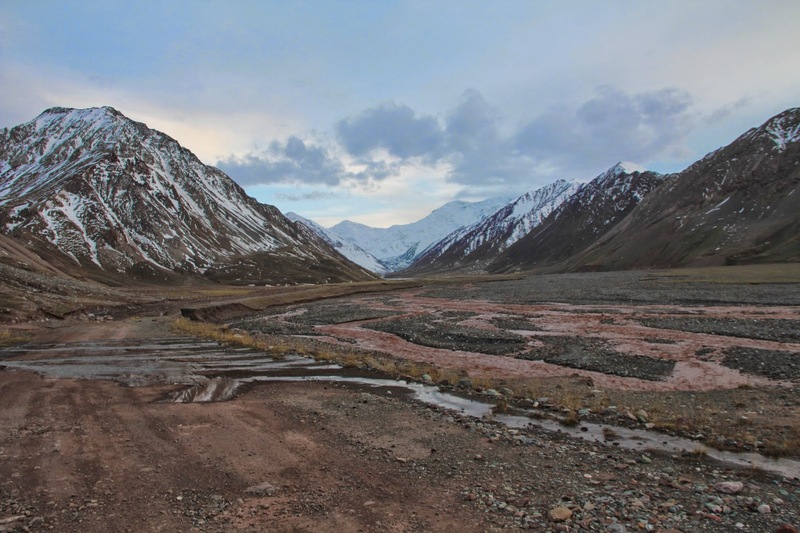 Click here for more information on the Pamir Highway. 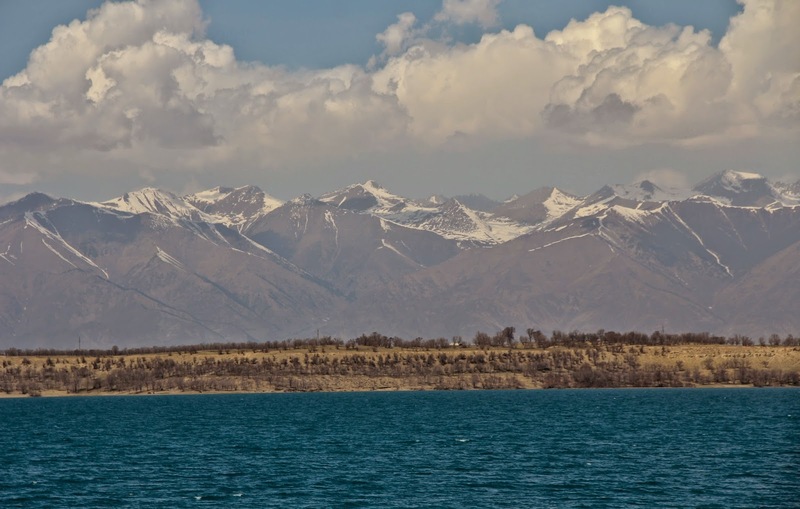 On our way, we will pass the towns of Gülchö, Sary Tash and finally cross the border between Kyrgyzstan and Tajikistan at the Kyzyl Art Mountain Pass. 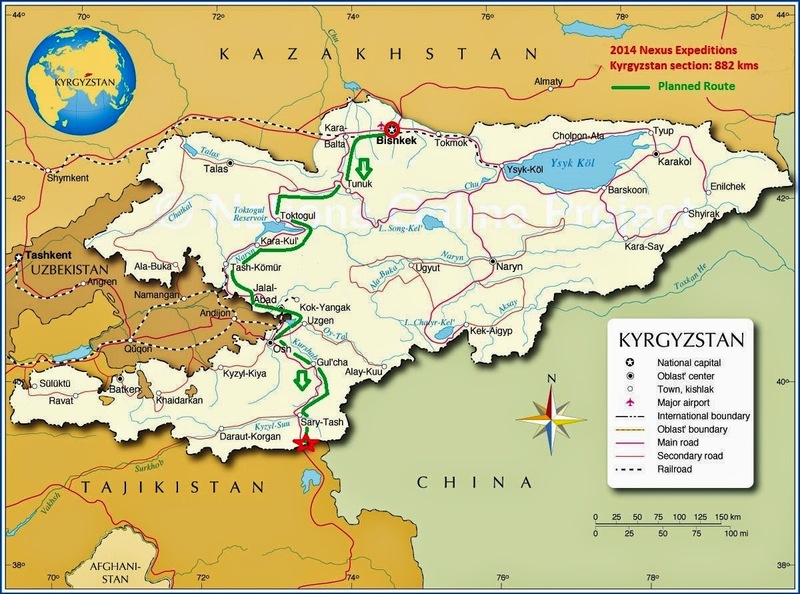 We plan to pass the Kyrgyzstan-Tajikistan Border at Bor-Dobo - Kyzyl Art Pass around May 23rd 2014. 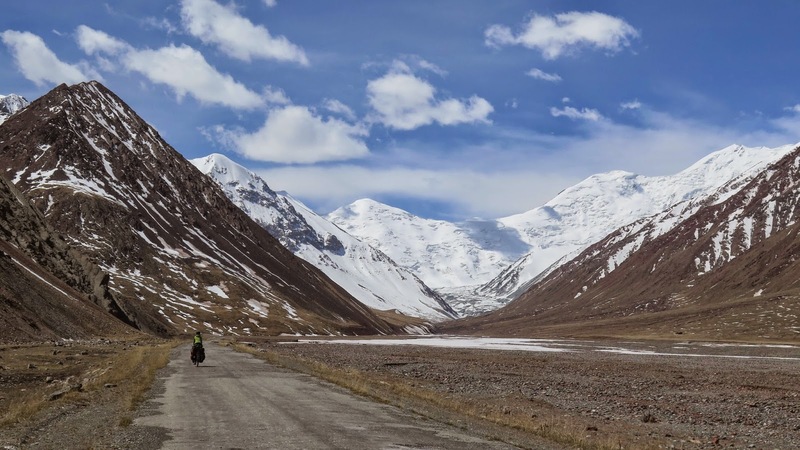 In Tajikistan, we plan to cycle through the Kyzyl Art Mountain Pass and the towns of Karakul’, Muzkol, Rabatakbaytal, Chechetky, Murgab, Karasu and Sasyk-Kel’. 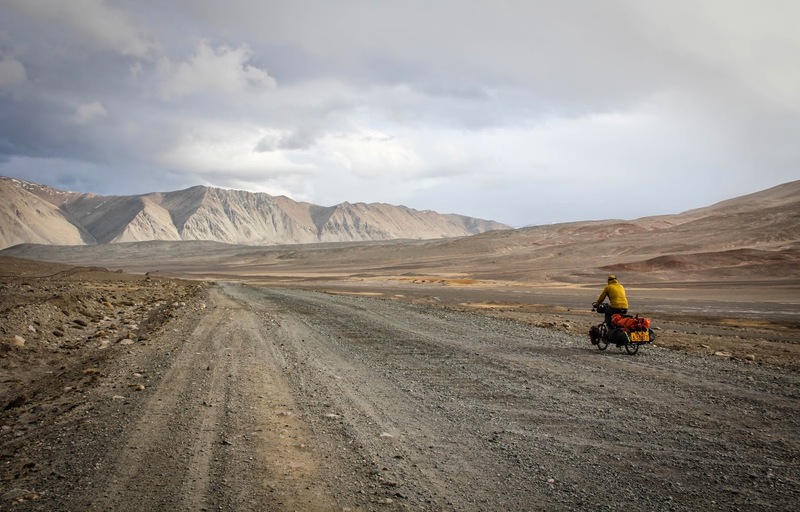 Near Sasyk-Kel', we will leave the Pamir Highway, in order to to ride the southern Tajik Wakhan detour. 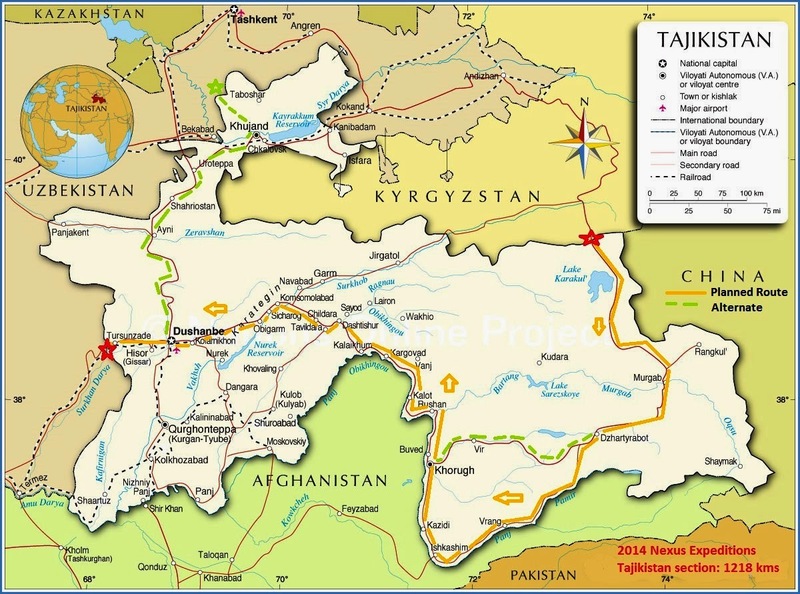 We will proceed through the towns of Khargush, Lavangar, Vrang and finally reach the Tajik-Afghan border crossing in the town of Ishkashim. 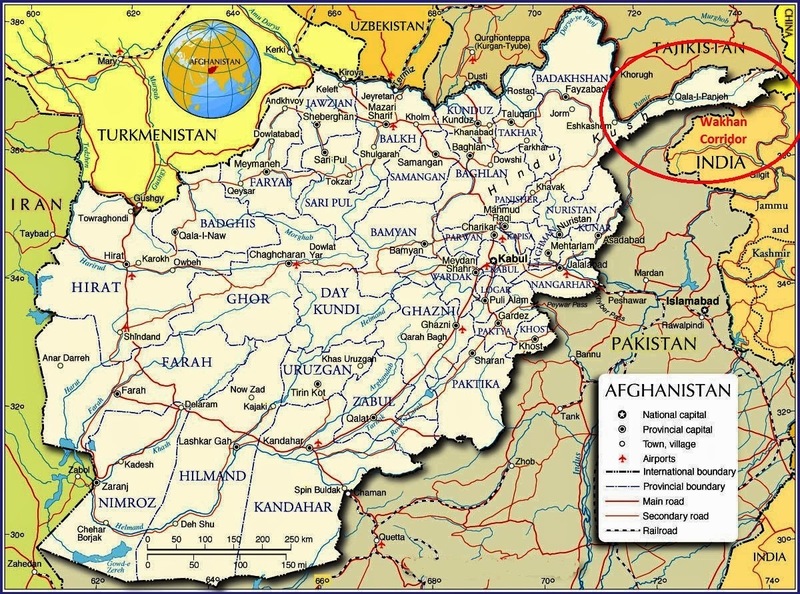 After our "detour" in the Afghan Wakhan corridor, we will proceed through the Tajik towns of Khorog, Rushan, Dekh, Barawin-Tar, Qal'ai Kumb, Khost, Komsomol Abad, Obi Garm, Takhtakhamit, Fayzabad, Vahdat, Dushanbe, Gissar and finally cross the border between Tajikistan and Uzbekistan at Denau – Tursunzade. Note: we have two alternate routes which we may choose to take, if we need to, because of time restrictions and/or weather conditions. Tag Arakaki, Jelandy, Shazad and Vin. B. 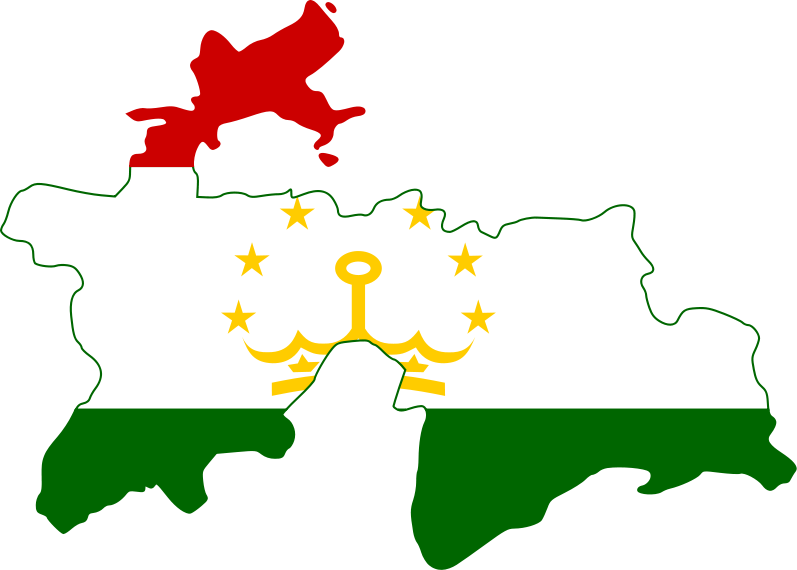 Going Northbound from Dushanbe to the Tajikistan-Uzbekistan border crossing of Buston – Jehanabad via the towns of Varzob, Kalon, Anzob, Rabot, Ayni, Shakhristan, Istaravshan, Nau, Proletarsk, Khujand, Takeli and Buston. 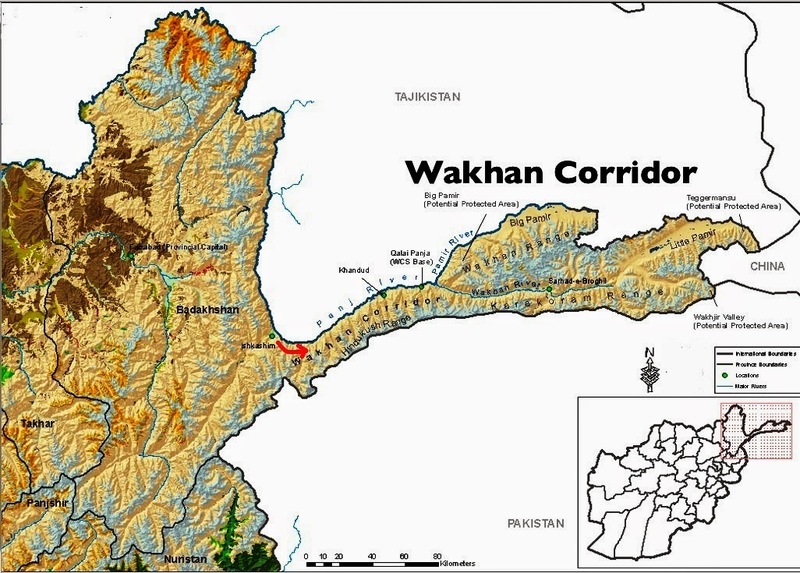 We plan to enter Afghanistan around June 1st through the border crossing of Ishkashim in the Wakhan Corridor and plan to spend a few days, visiting the Wakhan National Park. 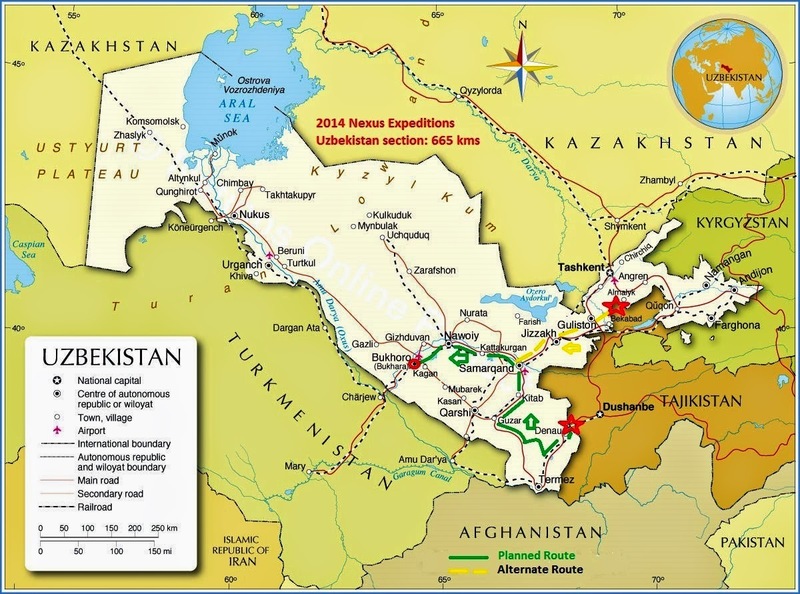 We plan to enter Uzbekistan in July 2014 through the border crossing of Denau – Tursanzade and cycle through the towns of Sariasiya, Denau, Boysun, Karashina, Dehqanabad, Ghuzar, Qiziltepa, Shahrisabz, Kitab, Qaratepa, Kenagas, Samarkand, Charkin, Juma, Kattaqorghan, Aqtash, Ziyadin, Karmana, Qiziltepa and finally Bukhara.Click here for more information on the "Magic of Bukhara" . 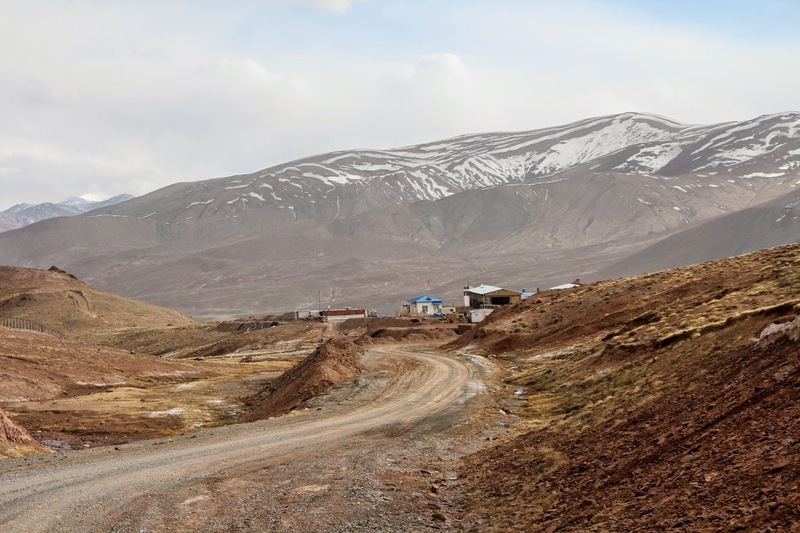 Note: we have a second alternate route which we may choose to take, if we need to enter Uzbekistan from a northern Tajik-Uzbek border crossing near the Tajik town of Buston. 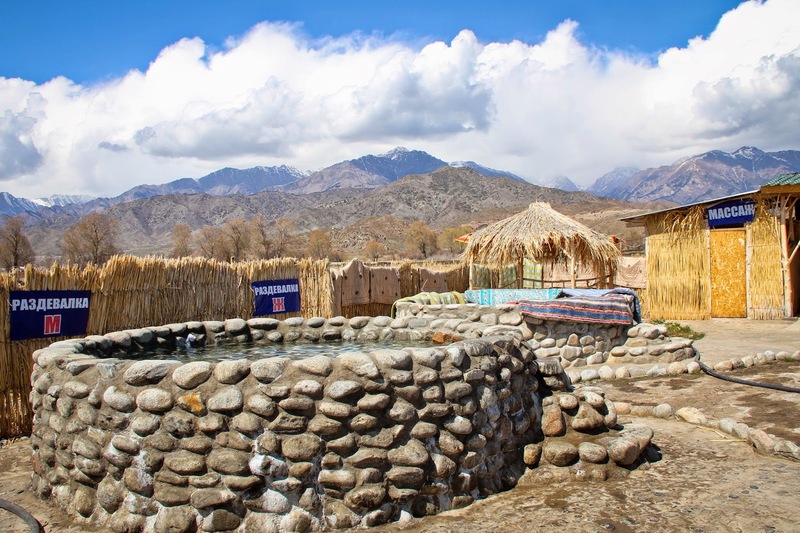 On that alternate route, we would be potentially cycling through the towns of Buka, Pakhtaabad, Jizzah, Ghallaaral, Bulunghur, Samarkand, Charkin, Juma, Kattakurgan, Aqtash, Ziyadin, Karmana, Kiziltepe and finally Bukhara. Going forward, after Bukhara, we will have a few options to pick from in order to travel to the western coast of either Europe or Africa in order to start the row across the Atlantic Ocean. 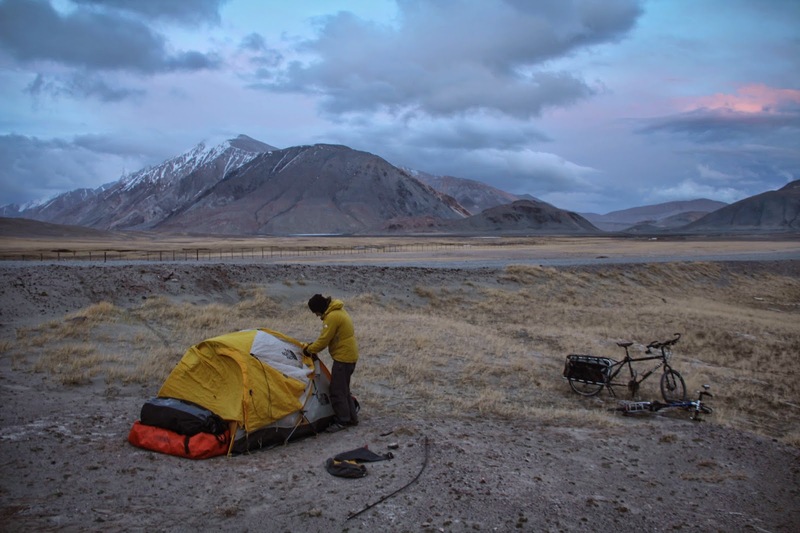 We will have completed the entire expedition, upon reaching Knik Lake, after having circumnavigated the globe, crossed the equator and reached two antipodes via human power.